Art lovers will be in for a treat this weekend with a chance to enjoy the beauty of artwork and the coastal settings in which it is displayed. 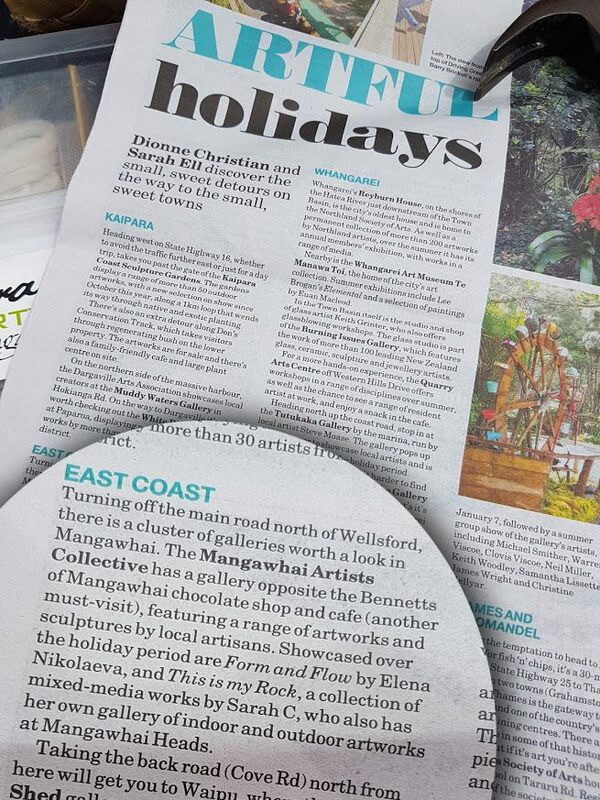 The Whangārei Heads Art Trail and the Mangawhai Easter Art Trail are both on this Saturday and Sunday. Visitors to the Mangawhai Easter Art Trail will get the chance to look at interesting and diverse art while peeking into artists' studios. With 19 venues, plus the Members' Exhibition in the Artists Gallery, this year's art trail has the highest number of participating artists in any trail so far. Spokesperson Kim Hamilton said organisers were especially pleased about the trail this year. "We have a cluster of venues in and around the Pioneer Village and the far-flung studios all are great drives, excellent for people who seldom travel beyond the Heads and Village." Central to the trail map are six venues clustered beside Mangawhai Museum which has its annual book fair on at the same time. "Last year people enjoyed visiting the heritage church, this year we are thrilled to be filling four heritage buildings - the church, post office, Tara Road School and the Te Arai library. "Then there's an easy stroll to the studio of Sarah C – Indoor Outdoor Art and across the road to Stylish Homes who have offered us a beautiful show home for what is going to be a super display." Tucked in and around the streets of Mangawhai are more venues for people to visit before heading for the outer reaches of the trail. Stunning spots like Barrier View Dr, Pigeon Berry Lane, Cove Rd, Pebblebrook Rd and Daisy Cottage on Devich Rd will give art lovers a chance to chat to the artists and enjoy beautiful vistas and parts of Mangawhai often unseen by visitors. Participating in the trail is free but the guide - which includes a map - is $10 and is on sale now at Mangawhai Artists Gallery, Gas Mangawhai, Mangawhai Museum and Mangawhai Books and Gifts. People can visit mangawhaiartists.co.nz/art-trails for more information. Meanwhile, The Whangārei Heads Arts Trail will see artists' work exhibited in locations spread along 35km of beautiful coastline. The event was the brainchild of the Discover Whangārei Heads Tourism group and was first held in 2012. About 800 people attended that first event, by the second year the number had doubled and now visitors from outside of the region head along. This year 50 artists will be exhibiting a range of work from jewellery, glass and wood to photography, painting and pottery. The 2019 event starts in Onerahi and ends at Ocean Beach. To find the locations punters must purchase the $5 trail guide - on sale at ​The Hub, Whangarei Town Basin & iSite State Highway 1 -which will include a free raffle ticket. For more information visit www.whangareiheadsartstrail.org.nz. ​Mangawhai artists are working tirelessly to achieve their goal of building an art workspace for their community. As the word has spread pledges have come in from around New Zealand and the world. Others pledging include US billionaire Ric and Suzanne Kayne. Crowdfunding company PledgeMe says their feedback for the fundraising campaign is very positive. Online publication The Big Idea has also featured the project, with Mangawhai Artists Inc (MAI) identified as a great example of the power of community. Sam Grover writes that ‘successful artists have a strong network of friends, family, other artists and arts-adjacent people who they can tap into for ideas… MAI provides both exhibition space where artists can display their work, hone their craft in workshops, and learn from one another. It’s a community that everyone can benefit from, not just the artists, but the wider Mangawhai community. Grover distinguishes between a collective (a group of people pooling resources) and a community (a group of people who work together to build each other up) and says there’s a particular magic in community. The newly designed workspace will have much needed facilities to meet the demand of an expanding creative and artistic community. Pledges must reach the financial goal by the end of March. At the time of publication over $60,000 has been raised.  How can you help? Go to pldg.me/mangawhaiart and make your pledge now! Photo, from left, Rosina Kamphuis, Janine Brougham and Els Switser push their fundraising campaign at the Mangawhai Tavern Market. ​Promotions co-ordinator Belinda Vernon has announced the launch of PledgeMe, the fundraising initiative to raise $100,000 by the end of March to build an art workspace at the Mangawhai Artists' Gallery. 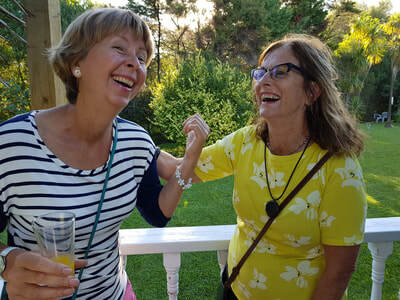 The launch was, fittingly, held in the courtyard of the Bennetts complex at the village, where artists, friends, families and supporters, including the Kaipara mayor, gathered to be appraised of the project and pledge their monetary support. Last week pledges received from 81 people amounted to almost $21,000 with 25 days of the campaign still to go. Pledges are collected after April 1 only if the target of $100,000 is achieved.  Go to pldg.me/mangawhaiart to follow progress and pledge your donation. Photo, above: Celebrating the PledgeMe launch on February 23, from left, Mary-Anne Boyd, MAI chair; Joanna Roberts a Friend; Peter Wethey, deputy mayor; Belinda Vernon, FOMA coordinator; Hinurewa te Hau, Creative Northland GM; Jason Smith, Kaipara mayor. ‘Frame of Mind’ is a compelling exhibition by seven accomplished and explorative artists, developing new ideas and themes, using exciting mediums with a range of diverse topics. The title is a play on words evoking the state of mind of the artist with a bit of mystery and creativity added in. 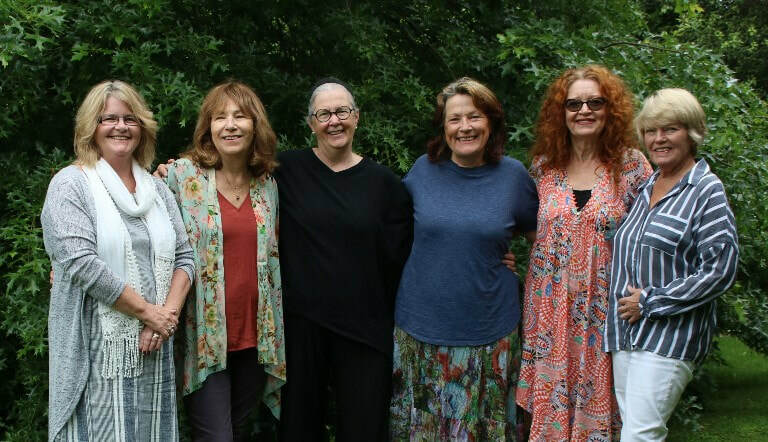 See works by Edith Chappell, Marina Bagley, Nicola Everett, Ngaire Evans, Barbara Cope and Jan Grover (Mary-Ann Boyd absent from photo) from March 8-20 at Mangawhai Artists Gallery 45 Moir St.
I’ve spoken to a lot of artists in my time working with The Big Idea. And one theme that has come through almost every - if not every - conversation is the power of community. Successful artists have a strong network of friends, family, other artists and arts-adjacent people who they can tap into for ideas, support or even just a sounding board. Mangawhai Artists Inc is a great example of this. This organisation provides both exhibition space and studio facilities where artists can display their work, hone their craft in workshops, and learn from one another. It’s a community that everyone can benefit from - not just the artists, but the wider Mangawhai community. Mangawhai Artists Inc is a small gallery an hour and a half drive north of Auckland. Unlike commercial galleries, it’s run “by artists for artists.” If a member of Mangawhai Artists sells a piece of work during one of their exhibitions, he or she gets the entire value of that piece. If you sell for $100, you get $100. This is a significant difference from the commercial galleries, which charge commissions of 40% or more. Sold a piece for $100? Well, you’re only taking home $60 of that. This model works for Mangawhai Artists because it’s less of a business and more of a cooperative social enterprise. 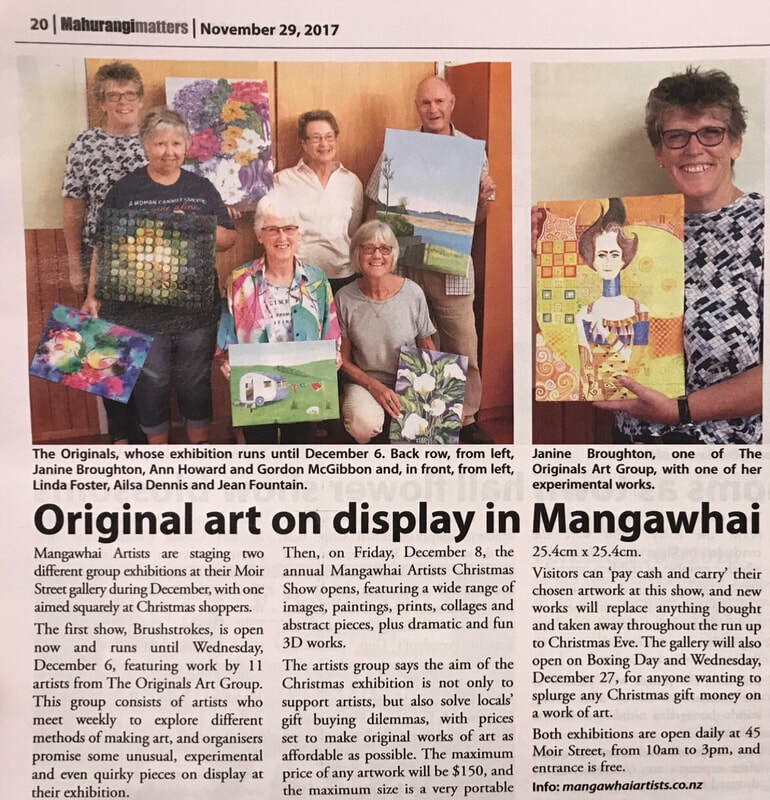 Artists who join Mangawhai Artists can display their work and hopefully sell it at exhibitions - but they also need to pitch in and help with other artists’ exhibitions. It’s a very reciprocal way of working. On top of this, there are lots of benefits to the artists from pooling resources. For example, let’s say you were working alone, and you had an exhibition coming up. To promote your exhibition, you could call around various journalists, hoping to get picked up by one of them. Take it from me - I used to do this for a living, and it’s gruelling work. What’s more, it’s even harder if you’re doing it on your own, because nobody knows who you are. But if you band together with some other like-minded artists, you can do this more effectively. 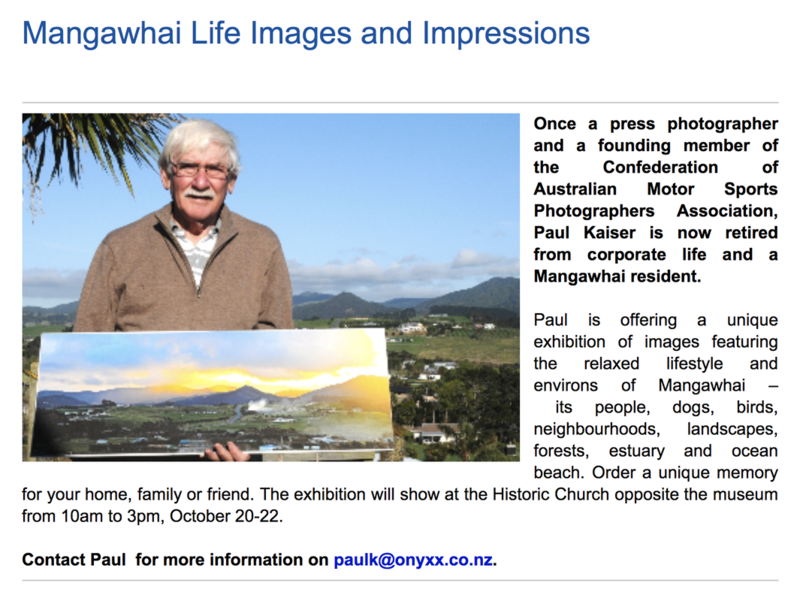 You can see how this works by looking at the ”in the news” bit of Mangawhai Artists’ website. These artists aren’t just promoting their work individually - it is being promoted by and through the wider Mangawhai Arts community, which gives it that extra bit of credibility and media value. What’s more, it’s a lot less time consuming when you pull together to spread the grunt work of ringing around to a bunch of other artists. Then you can go beyond the collective, and into a community as well. This is a subtle, but important difference. A collective is a group of people pooling resources, while a community is a group of people who work together to build each other up. There’s a particular magic in community. Mangawhai Artists Inc is full of artists from all different skill levels, backgrounds and points in their careers. This means there’s tons of opportunity for members to learn from one another, and for more experienced members to give the less-experienced members the confidence boost and push they need to start exhibiting. At its core, this is what Mangawhai Artists Inc is all about. They develop each other, they push each other, and they teach each other things that they never would have otherwise learned. One of the main ways the members of Mangawhai Artists Inc help each other out is through regular workshops. But they can only do this during the winter, because space is limited. During the other nine months of the year, they’re using the space for exhibitions. Also, the space doesn’t have a toilet and facilities! This is not ideal as workshops can last at least half day or more. The good news is they have designed a new workspace with proper facilities to meet the demand of the expanding creativity and art in the community. Here’s how you can help - Mangawhai Artists is raising money through PledgeMe with the aim to start building in May. They’ve got an ambitious and admirable goal to extend facilities - $100,000! (See their plan below). So if you’ve got a couple dollars to spare and you’re an art lover, go ahead and back their great plans, delight them by chucking it into their piggy bank. It’s a great way to support a growing artists’ community up north. 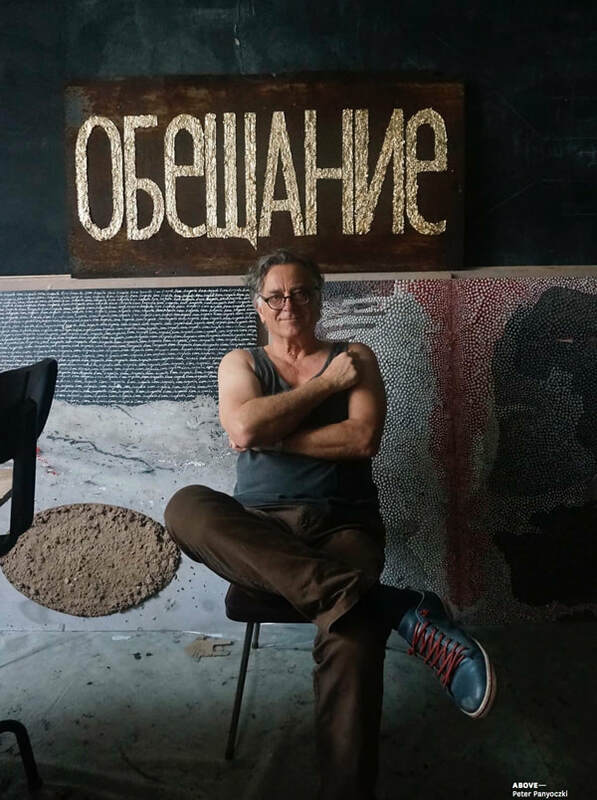 Hungarian-born artist Peter Panyoczki, who escaped Eastern Europe as a small child, and came to New Zealand in the 90s, recently completed a residency in Vladivostok, Russia. where he experienced both déjà vu and a wave of inspiration. I drive up to Kaiwaka, that small sleepy settlement before you are daunted by the Brynderwyns. The cluster of shops is dominated by a massive hill Pukekaroro that was once the scene of a huge conflict between Maori in the 1820s called Te Ika-a-ranga-nui. Here is the artist Peter Panyoczki’s studio, a large beautifully structured barn of a building. Glass windows face out to a lush lawn and old fruit orchard, and beyond to a kahikatea forest. The white studio walls are adorned with recent work, ready to be exhibited: Feet of Clay for a group exhibition at the Vivian gallery in Matakana, and Surface and Beneath, a solo show at the Taksu Gallery in Singapore. Panyoczki is fearless and prolific. His academic past as a linguist and art historian is reflected in his work. He is searching in depth for the origins of cre- ativity and the processes of perception. His art is layered with meaning; and although his work evokes associations of primordial forces, states of the earth, archaic elements and is filled with explosions of delight, it reflects also on our present life. I ask him how he came to be here, a man with such a history of transformation: from child refugee fleeing with his parents the Soviet pillage of his homeland after the Hungarian Revolution, finding safety in Switzerland, to another small haven of a country at the bottom of the world. His answer is that it was simply destiny; he met his wife Tatjana, a jeweler, in 1991 at the Café Odeon in Zürich, and followed her to the end of the world, to New Zealand. It was a turning point. Panyoczki elected to live here, work as an artist and become a man living between worlds. He found a new home in New Zealand, but the memories of his flight to safety as a child in 1956 are very much alive in his memory. That’s not unlike the Austrian artist Friedensreich Hundertwasser, who journeyed to New Zealand and found paradise in the Bay of Islands, but also lived a dual existence moving between Vienna and the windswept mangrove bay that he made his home. Panyoczki describes his work as an archeology of visual, sometimes verbal, semantics. His two-dimensional and three-dimensional work, mostly medium- to large-scale, takes in ex- traordinary visual experiences. He is committed to exploring new techniques, with natural materials like earth, ashes and wood, or digital prints and light installations. Each work is beautifully rendered, and comes with a thought process of staggering complexity. These magnificent combinations of materials, and the occasional use of text – poetic and philosophical, sometimes in Braille – draw the viewer into a transformed visual experience. His surfaces have an almost mystical quality. Panyoczki’s mind is one of intense flexibility – he understands global issues, politics and the trends that sweep the planet. As the Viennese art historian Herbert Lachmayer writes in Panyoczki’s mono- graph, also called Surface and Beneath, “for me you are a kind of inventor of worlds among culture, civilisation, and drafts of yourself”. Panyoczki exhibits in New Zealand galleries and in Zurich and in Singapore. He has a close working relationship with Sir James Wallace, one of the earliest patrons of his art. In late 2018, he took up a Wallace Foundation residency in Vladivostok, Russia, where he had the opportunity to create and exhibit his work at that city’s Artetage Museum of Modern Art. He and Tatjana were guests of the the New Zealand Honorary Consul in Vladivostok, Martin Tate, and painted in a basement studio. a farm on the Kaipara Harbour but consent processes and concerned neighbours have forced them to look elsewhere for a location that will fit. Panyoczki’s art appears fragile, it is anything but. His art can stun you with its power. He pours his DNA, his history and his passion into his work. As Panyoczki says, sometimes his work is beyond language, that visual reflection is more important than words. PETER PANYOCZKI WILL EXHIBIT AT ARTIS GALLERY, PARNELL, IN NOVEMBER 2019. 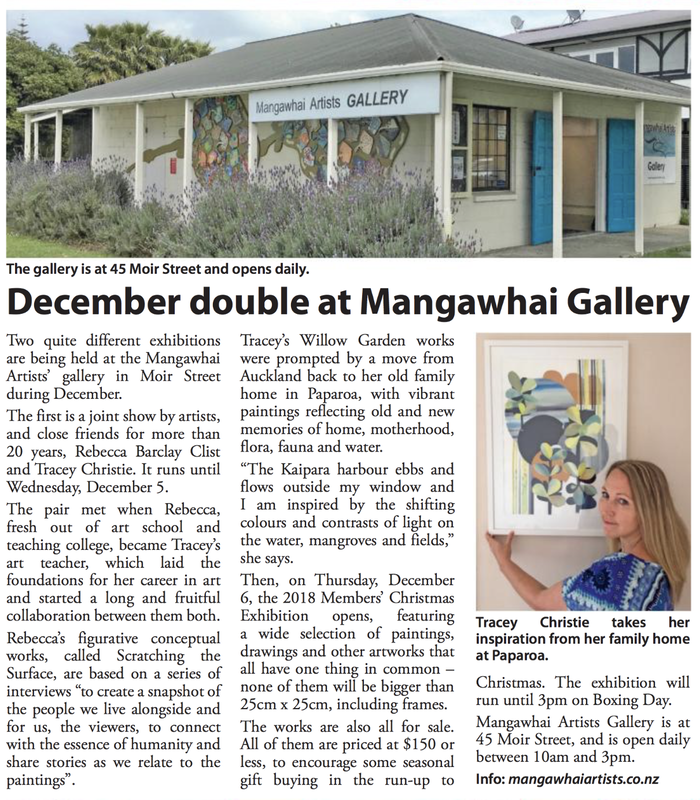 Mangawhai’s much-loved space for all genres of art needs to expand, and the artists who consistently delight with beautiful and diverse exhibitions have an ambitious and award winning plan. With the aim to extend the current Mangawhai Art Gallery, including an extra workspace as well as bathroom facilities, Mangawhai Artist Inc (MAI) officially launched a five week fundraising campaign on February 23 at Bennetts Cafe, hoping to raise $100,000 by the end of March. MAI deputy chair Lynn Middleton says although the society receives numerous requests for more art opportunities including community projects as well as adults and children’s programmes, the gallery in its current state is too small. Running until March 31, MAI have set up a crowd funding ‘PledgeMe Project’ which works by people donating differing amounts of money in return for a variety of rewards including workshops with experienced artists, art books, art works, restaurant vouchers, expressions of appreciation and even aspects of the building itself such as the doors or windows. 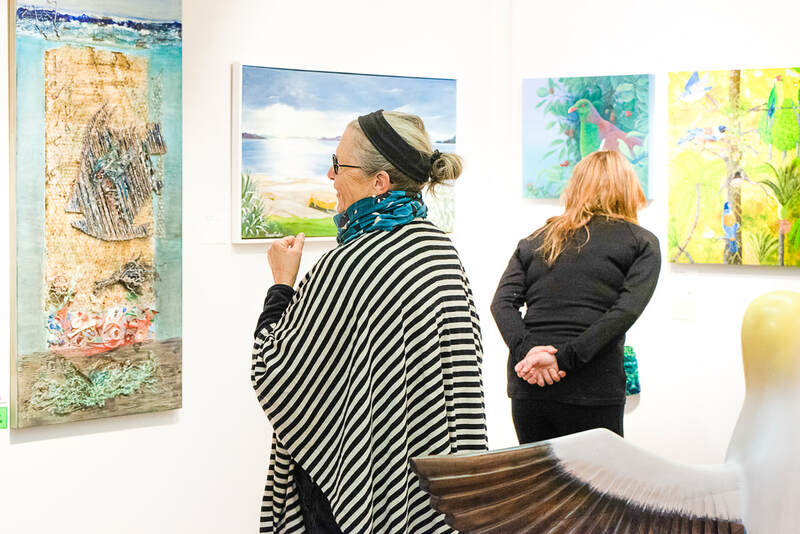 A community asset worth over $250,000, Mangawhai Gallery is known for its quality fortnightly exhibitions, attracting over 12,000 locals, visitors and tourists every year. In 2018, 2000 people participated in the second community project ‘One Moonlit Night’, marking the venue as an art workspace for community wellbeing, participation and creativity. Middleton says the artists hope that building can begin in May, however pledges will only be collected after April 1 if the target of $100,000 is reached by March 31. For more information contact mangawhaiartists@gmail.com. Follow MAI on Facebook and visit the website mangawhaiartists.co.nz for updates. Mangawhai Focus, 23 February, 2019. For Hannah Peri Braithwaite, Marilyn Davies and Bevan Smith, their artistic journey sees them exhibiting together and celebrating an exciting milestone in each of their artistic lives, though their individual journey to this point has been very different. A first exhibition for them all, it is also time to show their contrasting styles to the public, fellow artists and art lovers. In ‘Three Artists Three Journeys’ the public will see three distinctive and contrasting styles of art works, from finely drawn native birds by Bevan to bold lavish portraits by Hannah and, for Marilyn, ‘a cross section of the ideas and techniques I’ve been concentrating on in the past 18 months’. They are all looking forward to showing their art work and interacting with people during the exhibition, as Bevan explains. An exhibition in three parts, visitors will be impressed at the richness, talent and individual style of expression. A great show from three artists each on a creative journey. Artists, residents, visitors and officials congregated at Bennetts Cafe on Saturday, February 23, for the official launch of the Mangawhai Artists Inc crowdfunding campaign to raise money for a dedicated workspace. Kaipara District mayor, Dr Jason Smith, and general manager for Creative Northland, Hinurewa te Hau, supported the local artists in opening their PledgeMe campaign, which has already generated pledges totalling $14,715 at time of print. The building project will provide a larger working area for artists at the local gallery and organisers have an initial target amount of $100,000 to raise in the next five weeks — before March 31. 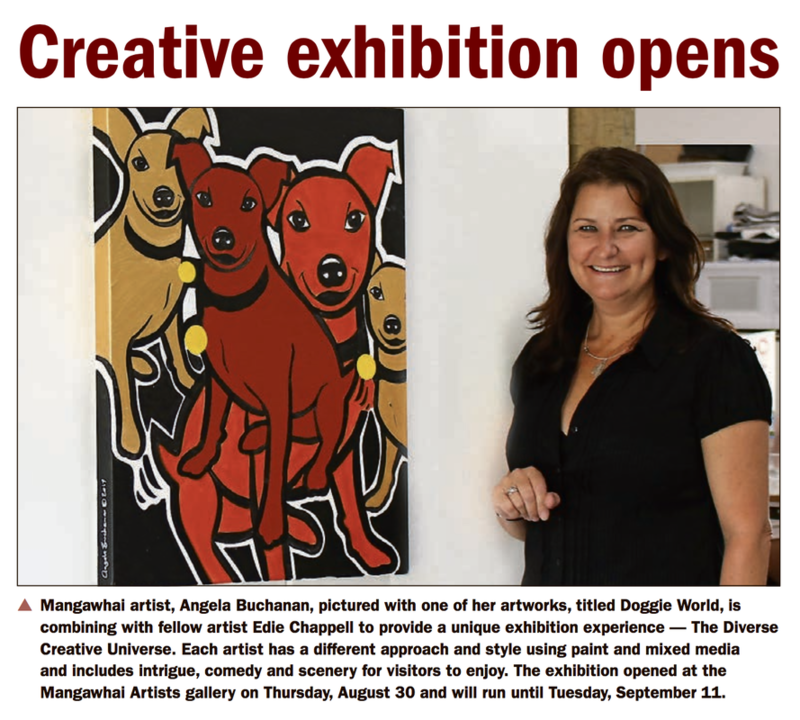 “Mangawhai Artists Gallery is known for its quality exhibitions but is too small to have workshops and classes at the same time as exhibitions and we receive lots of requests for more art opportunities,” said spokesperson Lynn Middleton. People able to help can donate and receive a charitable receipt or pledge online in return for a reward. In this, all or nothing campaign the group must meet their target or the pledges are not collected and the building will not proceed. Pledging a block for the building is one way, residents can be rewarded for their generosity. The block they buy will become a part of the actual building and a name plaque attached to it. In addition, two windows and one set of double doors, also named, may be pledged. Other rewards include books, workshops, artworks, gift packs, a box of pastels and gift vouchers. “It is important for people to know that the art workspace and the artists’ gallery are community-owned so achieving this will benefit our community now and in the future,” said Mangawhai Artists Inc chair, Mary-Anne Boyd. For further information email mangawhaiartists@gmail.com. A short exhibition has opened at the Mangawhai Artists Gallery named Earth 2 Sea, showcasing works by popular artists John Ecuyer and Kevin Willcocks, whose work complements each other well — resonating with the natural world of wood. Wood is John’s passion and his intricate work treasured by those who own it — both in the Kaipara and around the world. “I have been working with wood for 30 years now, and there are still adventures to be had upon entering my workshop. Whether it is turning on the wood lathe or getting out handmade Italian rifflers to shape a piece of wood handpicked from the storage rack,” said John. Kevin’s work covers a range of paint mediums with some of the artwork featuring driftwood, composite and textural materials and using interesting framing and structural techniques. “The New Zealand coastline and landscape fascinates me with its ever-changing colours and moods, continuing to inspire and provide motivation for my art. 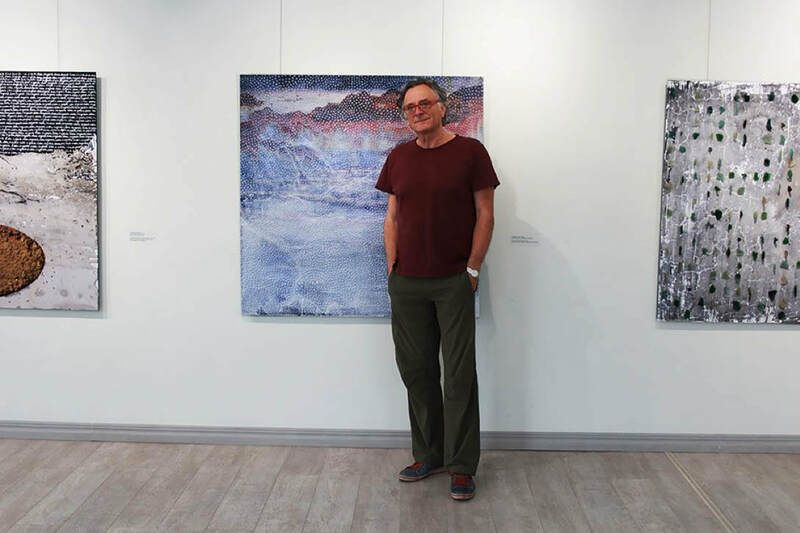 My works explore the relationships between colour harmonies and surface textures, providing a vast range of possibilities through material choice,” said Kevin. Kevin comes from a building background, which combined with a love of the great outdoors, enables him to express himself freely through his art, experimenting with form, technique and materials. The gallery is open daily from 10am to 3pm. The Mangawhai Artists Gallery presents two summertime exhibitions for the community and visitors to enjoy, showcasing a huge variety of creative styles and pieces. More than 40 artists have contributed to the Christmas exhibition, which is open now, daily from 10am to 3pm. All art on display is priced to be affordable for Christmas shoppers who will appreciate the newly installed Eftpos facility. Mangawhai Artists representative, Lynn Middleton, assures there will be something there of interest to everyone as there is such an array of styles in the collection — bold and subtle, large-scale and small, abstract, sculpture and weaving — items that will intrigue and delight. 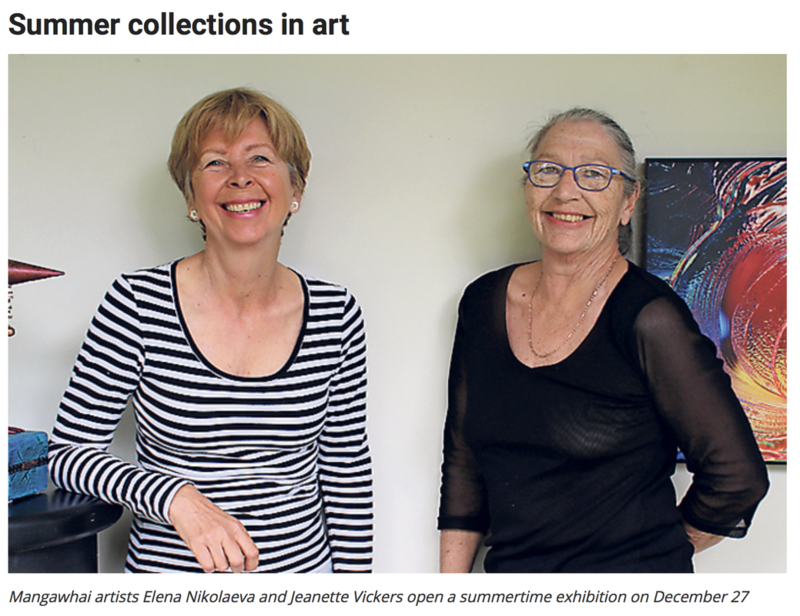 On December 27 the gallery will celebrate summer holidays with a display of works by popular artists Elena Nikolaeva and Jeanette Vickers in their In the Spirit of Summer exhibition. Elena’s mixed media objects have a quirky, fun character, and she also has three-dimensional and two-dimensional items for this show, and Jeanette will present her bright summer garden photographs, which are described as out-of-this-world, surreal, abstract and bizarre, inspiring summer gardeners. In addition, another exhibition will open for two days only on January 4 and 5, in a pop-up gallery behind the Mangawhai Medical Centre in Fagan Place. The hall is studio base for a group of Monday artists to meet and share their creative knowledge, and they invite all art enthusiasts to visit. “We have been meeting for a long time, and many of our group were new to Mangawhai and to art when they first came along. We are always thrilled to welcome newcomers — we love encouraging people to join us and become artists in the making,” said organiser, Ann Howard. In a further exhibition opening on January 10, Donna Shadick and Leslie Cleary return to the gallery in a joint exhibition. Donna’s presentation called The Horse and Mankind conveys the beauty and grace of the horse as a servant and companion to man through the ages. Leslie Dawn to Dusk presents captures the beauty of walks along the beach with a series of paintings in oil on canvas. 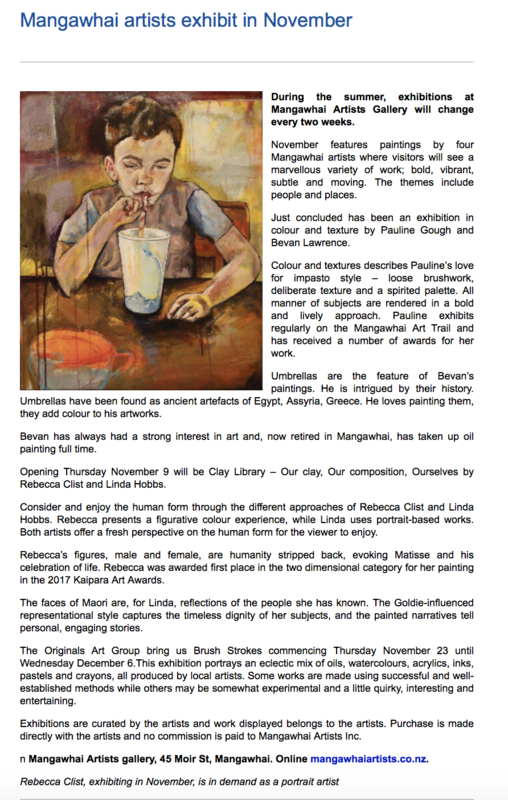 For more information visit mangawhaiartists.co.nz or phone Ann Howard 021 653 587 or Lynn Middleton 022 2694 1149. Northern Advocate, 31 Oct, 2018. Selected excerpts form the article. Northland's business community came together to recognise the best at the 2018 Westpac Northland Business Excellence Awards at Forum North on Friday. 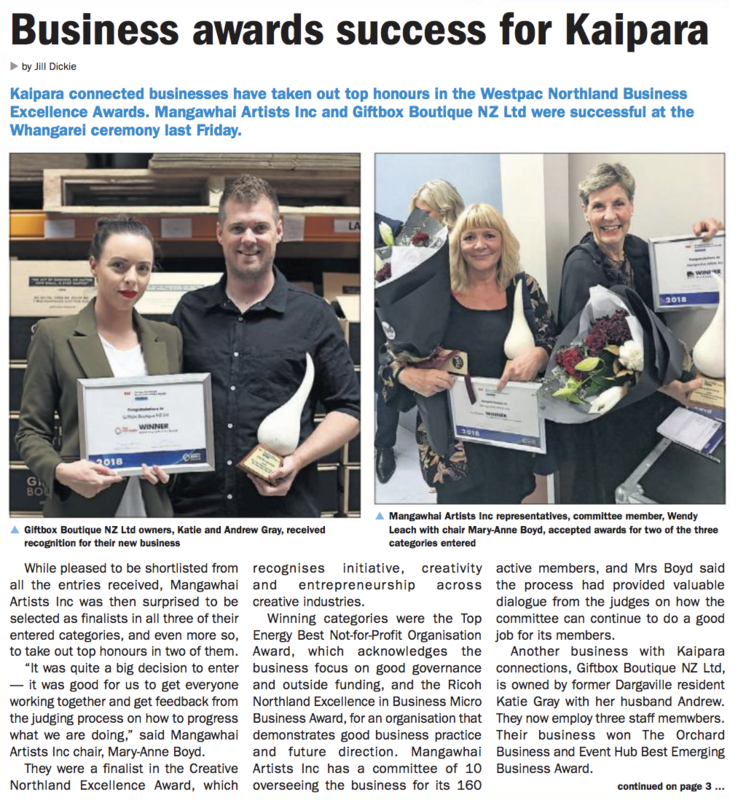 Businesses from throughout Northland submitted 46 unique entries across five business categories, seven ancillary categories and an overall supreme winner. Mangawhai Artists Inc - winner of the Ricoh Northland Excellence in Micro Business (1-3FTE) Category. Aligned Movement Ltd and Jessie Rose were finalists. The top few in the micro category were all excellent, but the judges were particularly impressed with the scale and complexity of Mangawhai Artists Inc. From running exhibitions that appeal to all ages to negotiating with council over a new building and an addition to an existing one, setting up a complex website to benefit local artists and provide an information base, the work is done smoothly with a great deal of focus and determination, delivering great outcomes. 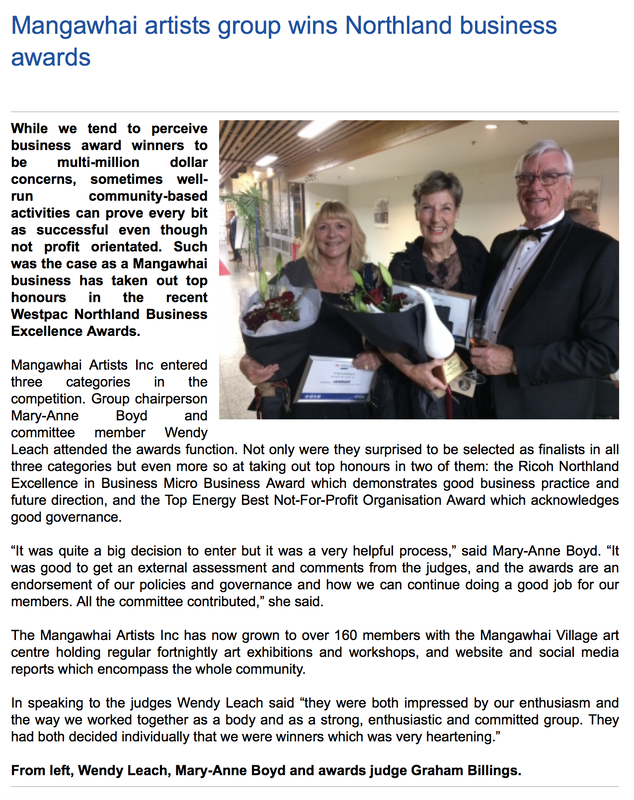 Mangawhai Artists Inc - winner of the Top Energy Best Not-For-Profit Organisation Award. R Tucker Thompson Sail Training Trust were also a finalist. In a new exhibition at the Mangawhai Artists Gallery, fellow artists Andy Griffiths and Mark Graham have teamed up to present their display entitled Chopping + Changing. Described as an exhibition of contrasts — urban and rural, watercolour and acrylics, street art and landscapes — this exhibition of work by these two Kaipara artists should intrigue and delight visitors to the gallery. Andy has been a professional artist since 1990 working for large corporate clients such as Warner Bros Consumer Products and small independent publishers, and digital painting has occupied him for the last ten years. “In 2017, I blew the dust off my 30-year-old set of watercolour paints and made the decision to start ‘real’ painting again,’ he said. His colleague, Mark, is a lover of street art and combines graphic design with a love of streetwear. He collaborates with local and New Zealand-wide artists to sell artworks, products and apparel. Mark studied graphic design at Massey University and keeps his creativity flowing by regularly changing his art style. Their combined exhibition opened last Thursday, September 27 and will run until Wednesday, October 10, 10am–3pm daily. Mangawhai artists Nicola Everett, Lynn Middleton and Tatjana Panyoczki are joining other artists in marking the 125th anniversary of women’s suffrage in New Zealand. Printmakers throughout NZ have contributed A4-paper prints which make up two carefully collated boxed sets. The prints will be displayed and archived as part of New Zealand’s 125 Suffrage Celebrations. Nicola says that being resourceful is becoming a more valued skill today especially considering the futures we may face. Organised by the Franklin Print Group, imagery in the prints celebrates the lives, roles, presence and influence of women, inspired by history, our national story, and each artist’s personal experiences or thinking. The printed imagery is primarily generated by a hand-made print process. 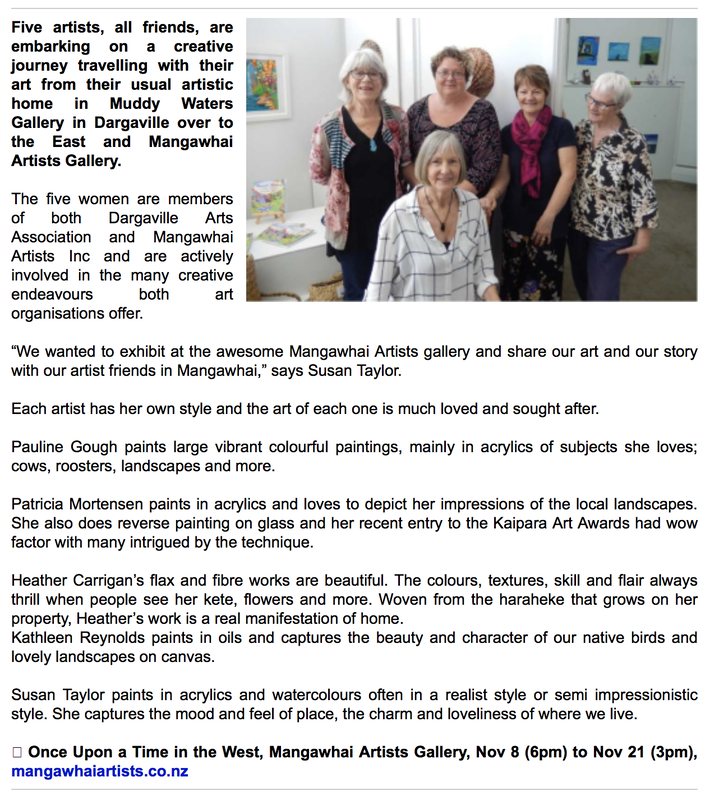 Nicola, Tatjana and Lynn are members of Mangawhai Artists Inc. 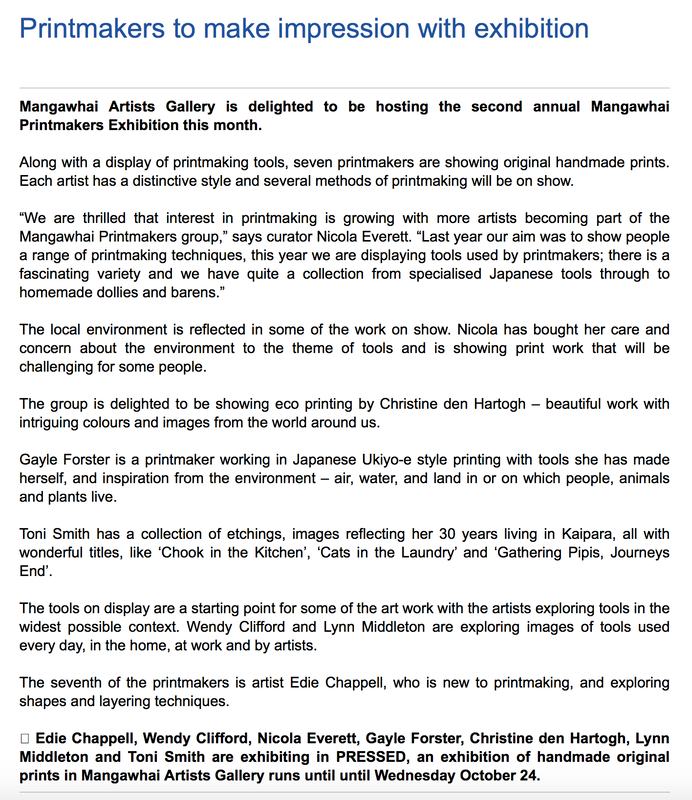 There is an opportunity to see more of Nicola and Lynn’s work when, and along with five other Mangawhai printmakers, they will be exhibiting in the Mangawhai Artists Gallery from Friday October 12 in an exhibition of printmaking. Image: A stitched work by Nicola Everett. In my favourite book «Borderliners» Peter Høeg wrote following, «Our language is too poor… no need to talk anymore». I cannot say this phrase changed my mind, but impressed so strong, that I think about it even today. Literally the same idea accompanied me at Peter Panyoczki's Exhibition. His visual expression is full of semantic polysemy and ambiguousness as well as linguistic diversity and limitations. Peter clearly knows that the own visual reflection is more important that any attempt of verbal explanation, and this led his choice of expressions closely related to an outness of language, or expressions distinguished from it at least. His method is simple yet direct, elegant, and powerful. Different stages of his stay are hidden amongst these masterworks, which shows only the fragmented memories and gives some references for interpretation or semiosis. This way, Peter gives us his philosophy of life through the narrative created by reproducing silent memories of his being in Vladivostok. The works parts of which I add to this note became the most touching. Оne by one they reminded the melodies of Ryuichi Sakamoto’s «async», the first solo album after eight years and a battle with throat cancer. And what is most important, the composer said, it is a soundtrack for an imaginary film of Andrei Tarkovsky, whose inspiring words put on the wall are almost the only prompt left by Peter. The wandering, fragile, forlorn, uncertain and mysterious poly-demensional works becomes intimately yours while the re-creation and search of our own inner self, that is free of any promise. «В поисках смысла» — так называется выставка, которая проходит сейчас в музее современного искусства Артэтаж во Владивостоке. Её автор новозеландский художник венгерского происхождения Питер Панёцки, сообщает DEITA.RU. Он родился в Будапеште, получил диплом магистра искусств, изучал германскую филологию и литературу в Цурихском университете в Швейцарии. Более 20 лет живёт в Новой Зеландии. Писал сценарии, проводил исследования, делал видео проекты, изучал мир через слово. Ведёт поиск выхода за пределы словесных символов в мир первоисточников — метафорических образов. Питер говорит, что его работы — это метафора-образ и предлагает зрителям прочесть слова, сказанные русским кинорежиссёром Андреем Тарковским. Лист с отпечатанными текстами висит на стене выставочного зала. Питер говорит, что мысли Тарковского наиболее ёмко отображают его видение. «Нельзя говорить о бесконечном мире применяя, инструменты, которые являются определёнными и конечными», — пишет Тарковский. Во Владивосток Питер Панёцки приехал два месяца назад по резидентской программе консульства Новой Зеландии. «Я приехал во Владивосток, не зная ничего об этом месте, не зная языка, не имея здесь друзей. И я чувствую здесь себя археологом, который лопатой ведёт раскопки. Мозг наш и есть лопата — человек должен постоянно откапывать смыслы», — рассказывает Питер, поясняя метафорический образ, который несут в себе старые лопаты, включенные в выставку как арт-объекты. На одной из лопат вырезано «Homo Faber», что с латыни переводится как «человек созидающий». Выставочное пространство наполнено графическими полотнами, выполненными из различных материалов и объектов, которые Питер «откопал» в своих путешествиях по Владивостоку. Двери, старые таблички с номерами домов, лопаты. Каждый из этих предметов, кроме своего прямого назначения, несёт большие смыслы. В нашем физическом мире двери открывают нам вход в дома, но дверь как образ несёт в себе нечто более глубокое – проход во времени, в миры воспоминаний ли, фантазий. Для каждого человека образ, открывающийся за дверью, свой и на выставке «В поисках смысла» каждый внимательный зритель увидит и прочувствует своё, «откопает» свой собственный смысл. «Я знаю, что сложно описать то, что я делаю, — это находится за пределами языкового понимания», — говорит Питер Панёцки. В его работах особое место занимает шрифт Брайля: он наносит его на холсты и предметы. Прочитать текст человеку, владеющему этой знаковой техникой, не удастся — знаки шрифта в работах художника трансформированы — он использует шрифт Брайля как метафору: человечество перестаёт видеть мир», - говорит художник. И нам нужно научиться воспринимать и видеть мир через соприкосновение с ним. Выставка – результат его познания Владивостока, зашифрованное в работах отношение к месту, с которым ему удалось соприкоснуться: городом, домами, бытом, людьми. «Мы тронуты теплотой и добротой людей, которых встретили во Владивостоке», — говорят Питер Панёцки и его жена Татьяна. За время пребывания во Владивостоке Питер стал чуть-чуть понимать и говорить по-русски, они с Татьяной рассказали, что обрели здесь много друзей. Выставка, которая открылась 1 сентября, уже получила очень позитивные отзывы в социальных сетях от зрителей. Выставка «В поисках смысла» проходит в залах музея современного искусства Артэтаж до 10 октября 2018 года. Адрес: Владивосток, ул. Адмирала Фокина, 25. Время работы галереи: среда-пятница с 10.00 до 19.00, суббота-воскресенье с 11.00 до 18.00, понедельник, вторник выходной. Вход свободный. 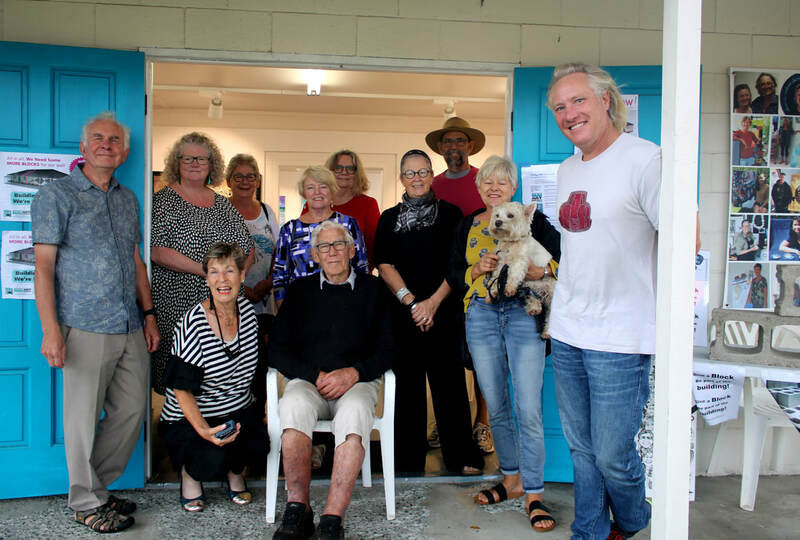 ​Drawing a Crowd With Mangawhai Artists Inc.
​Behind the double blue doors of the Mangawhai Artists Gallery lies a beating heart of artistic activity, pumping out inspiration to the whole community. This vibrant group currently boasts over 150 members, a scheduled season of 19 exhibitions and has plans to double the gallery space to allow for learning opportunities year round. In the last year, the gallery has had around 12,000 visitors and they are eager for more. The number of artists in the group is steadily increasing which is not surprising considering the active exhibition schedule, the learning opportunities available and something as practical as not charging commission on artwork sales at the gallery. Added to this is a comprehensive, elegant and up-to-date website that provides full details of the group’s activities and shows, profiles of the artists, and much more. Long term plans include working towards building a community art centre next to the Mangawhai Museum. It will have a larger gallery space and allow for the use of the current gallery as studio work space. 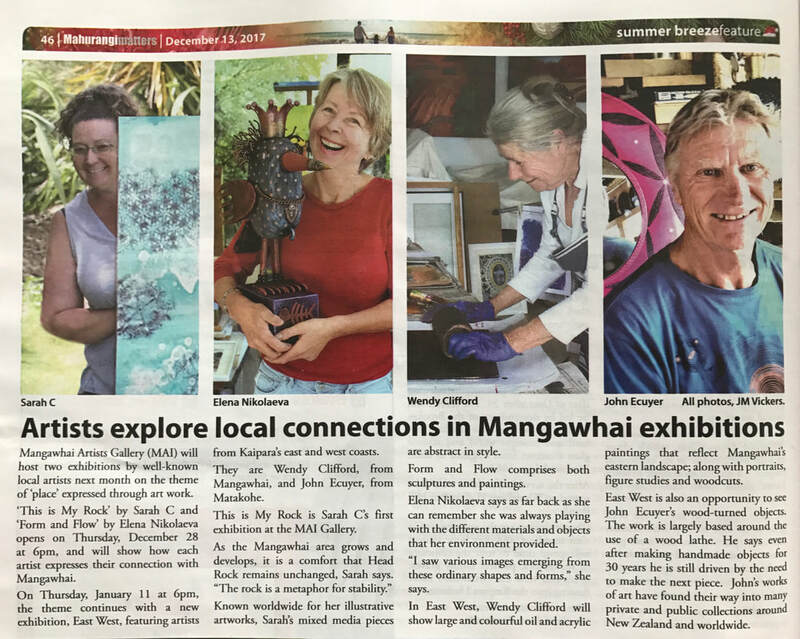 Vitality and energy are emanating from Mangawhai Artists Inc. and it is infectious, so they encourage you to make the journey to Mangawhai over the coming months and indulge in their wonderful program of exhibitions. You might just find yourself inspired to join up to their artistic revolution. Gallery season opens with art awards exhibit. The Kaipara Art Awards exhi- bition has arrived at Mangawhai Artists Gallery and launches their 2018-19 programme of exhibitions with a high calibre creative bang. A large collection of amazing and thought provoking art is on display. The stunning collection of over 50 works has been praised for its diversity, skill and beauty. Many of the artists have reflected on where they live and taken Kaipara to the heart of their entries for the 2018 Kaipara Art Awards. 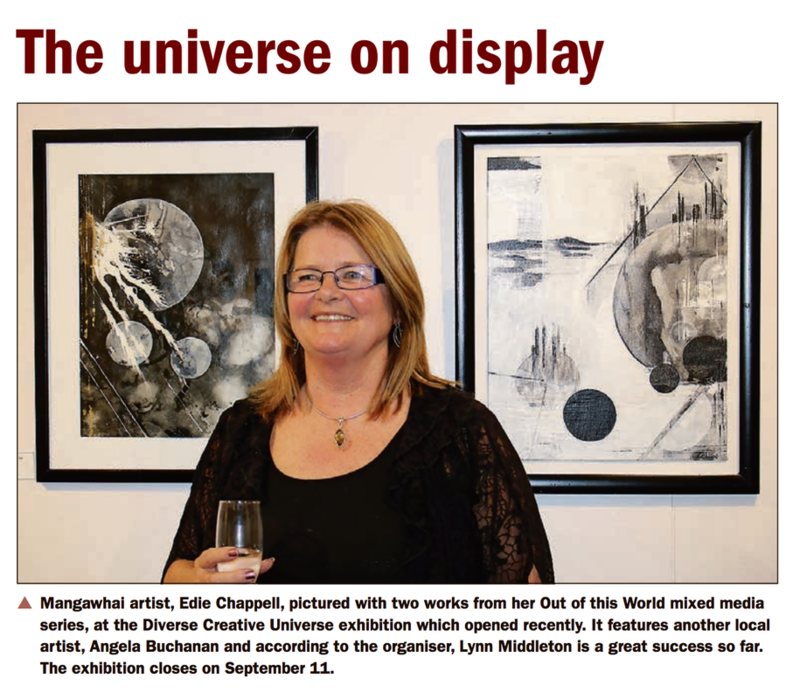 “The exhibition is outstanding, with fantastic artistic contributions – a marvellous showcase for local art,” said Mangawhai Artists chair Mary-Anne Boyd. The annual Kaipara Art Awards are hosted by Mangawhai Artists Inc and the Dargaville Art Association with the prize ceremony al- ternating each year, thanks largely to sponsors Pub Charity, Kaipara Lifestyler, Westmoreland Homes, Mangawhai Optometrists, and Flax & Fibre. Judge Richard Cranenburgh awarded the prizes at the Dargaville opening last month. On judging the awards for the second year in a row he said his choices came from many years of looking at art as well as ‘from the heart’. He praised the work on show. Prizes for two dimension: First Christine Moginie, Judges Award Peter Bradburn, Second Shelia Shadick, Third Annie Kitchener, Merit Carlyn Condon. Prizes for three dimension: First Samala Waipouri, Judges Award Margot Symes, Second Evonne Tana, Third John Ecuyer, Merit Terry Haines. Photos can be seen online at www.mangawhaiartists.co.nz/blog-archive. The Kaipara Art Awards are exhibiting at the Mangawhai Artists Gallery until 5.30pm, August 29. The last few weeks might have been chilly and wet but for many people in Mangawhai it has been a productive, creative and energising time. 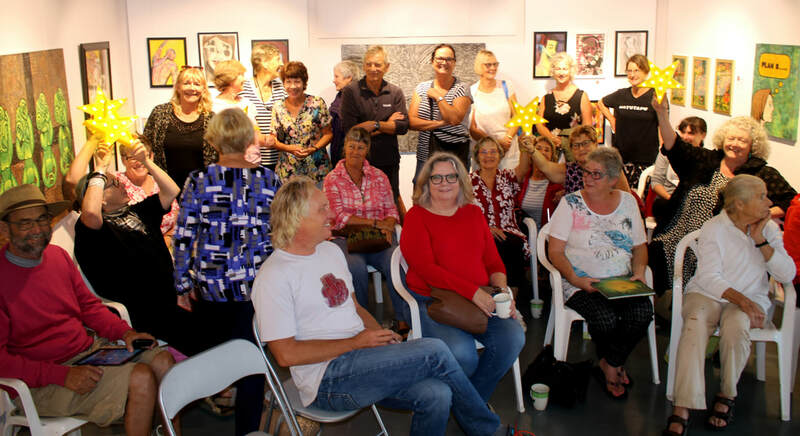 While the rain, frost and odd bursts of sun pervaded outside, the painting, drawing, printmaking and so much more made the Mangawhai Artists Gallery Winter Workshop programme the place to be to avoid winter blues. With over 36 learning opportunities, at times the gallery was as busy as summer exhibition weeks. Mangawhai Artists learning coordinator, Nicola Everett, thanked the tutors who made sure the workshops were well run, stimulating and provided for beginners and the more experienced. Mangawhai Artists Inc (MAI) is planning to expand their current gallery to build a year-round workshop space. Print Week was supported by Kaipara Creative Communities. ​Kaipara Art Awards judge Richard Cranenburgh provides his thoughts and overview of the entries and winners in this year’s art awards. 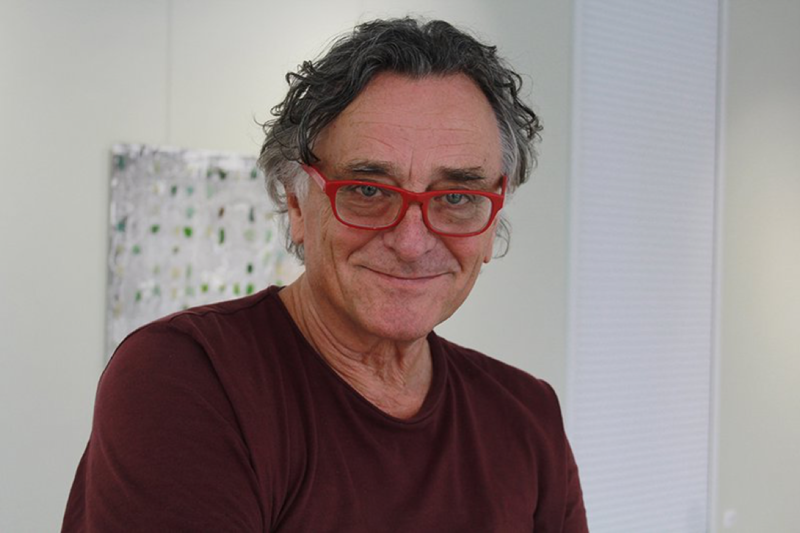 “I was really pleased with the feedback from viewers and artists who seem to appreciate my 'non-academic art speak' — as I do try and keep things clear and simple for everyone,” says Kaipara Art Awards judge, Richard Cranenburgh. “This year I did see an overall step up the ladder from last year, especially in the three-dimensional work — such diversity and high-quality craftsmanship. “In two-dimensional, I was also looking for presentation skills, in addition to work, which was thought-provoking, different from the norm, used of a different colour palette and showed a level of skill in the use of the chosen medium. “I wish to stress for future artists — two-dimensional and three-dimensional presentation is utmost, for example, no paintbrush hairs still in the artworks, edges of canvases painted thoroughly, no fly dirt on the top of the frames, if work is reproduced, mounted and framed well. With three-dimensional work, the back and the sides need to be as good as the front,” he said. It is refreshing to see an artwork using coloured pencils and well-executed. Drawing is the essence of design, art and creativity. The artist here 'young at heart' has great ability to see (some artists look but do not see) SO to you Carolyn “Now what you do in your art is unlimited”. 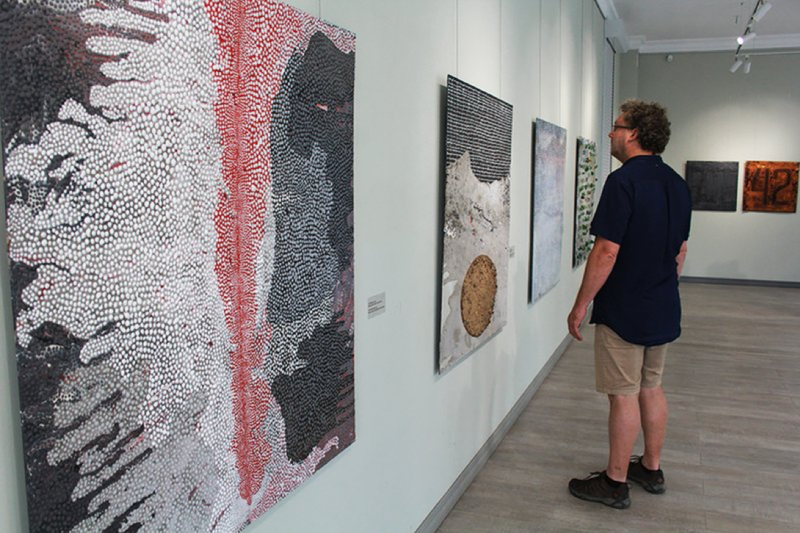 Mangawhai artist Linda Hobbs has expanded on her mixed media works, which have long graced galleries and events such as the annual local art trails, with a commission for a large artwork that’s now on public display. “I was asked to create an artwork to cover the outside of a herbalist shop wall in Hamilton. The mural of an old apothecary store incorporates the owners and family members and can be seen at Lorne Street,” says Linda. The work involved Linda searching for a picture of an old apothecary shop which was adapted and modernised, another of children with a bike added, then photographs of the owners and family included, and the image was ready for painting. After finalising details oil paints were used to copy the image onto a 1.2 metre square canvas, and it was then photographed and sent to a signwriter to enlarge onto a three-metre square vinyl sheet then adhered to signboard, before being installed on site. “So I did not camp out on the drafty street for weeks painting from a ladder like they had to do in the old days, I took advantage of the wonderful technology available today,” said Linda. The original painting Linda completed now hangs in the shop owner’s home. Like many artists Johnnie Daley had always doodled and sketched, and though he leaned towards an art course at University, he found after a short time that art school wasn’t going to take him in the direction he wanted to go. He turned to psychology which led to three years as a drug and alcohol councillor along with wife Becky Burton. However, after three years and feeling “desensitised” the pair went backpacking to Asia. On returning home they felt Auckland was not really where they wanted to put down roots so, with both having a long affinity to the eastern Kaipara, they chose Mangawhai. Johnnie commuted for two years working as a coffee roaster until the travel plus the disruption to a family with a youngster prompted the couple to concentrate full time on their art. While much of her time is taken up in the care of one-year-old Scarlet, after whom the gallery is named, Becky is an artist in her own right. Stained glass is her specialist field. While a secret ambition was to run their own gallery at some point, the offer of the gallery above Bennetts Cafe vacated by Geoff Mason earlier this year was too good to resist. The space allows the display of art while also offering a workplace for Johnnie where he is regularly seen in deep concentration, performing the delicate art of airbrushing. Scarlet Art Gallery displays the works of up to 30 artists. Variety is the spice of life and no more so than in the art world where likes and dislikes are entirely in the eye of the beholder be it as a long-term investment or a special piece for a special place, a new home perhaps, or a memory. Support for and from local artists is evident but several works are from further afield. Subjects cover a wide range from realism and impressionism to pop art and abstract, including some fine art and bigger originals to smaller prints, but all of high quality. Johnnie and Becky have developed a close relationship with local artists and the Mangawhai Art Centre and as people get to know just what’s up the stairs at Bennetts complex, they will realise Scarlet Gallery is the place to be for art in Mangawhai. Artist Johnnie Daley always had a secret ambition to run his own gallery. A recent community project that transformed Mangawhai Artists Gallery into a magical fluorescent New Zealand bush scene, has spawned yet another creative idea. However the artists involved require urgent input from those who attended the exhibition. ‘Magical Mangawhai Goes Bush! One Moonlit Night’ ran from April 20 to May 13, attracting record crowds to both the creation of the exhibit and to the finalised display with visitor numbers totalling over 1000. Organiser and local artist Rosina Kamphuis now has plans to capture the exhibit in film. Teaming up with local filmmaker Wayne George, the pair are putting an urgent call-out for video footage visitors to the community project may have taken. Following up on Computer Chap Steve Green’s advice, Rosina enlisted the expertise of Wayne – who has a theatrical, photographic and film background – to ‘weave his magic’ enabling one artistic project to ‘evolve out of the other’ she says. nIf you have footage of One Moonlit Night you would like to contribute, please contact Rosina ASAP on 09 431 5088 or on 021 052 9103. Anyone wanting to unleash their inner artist should head to Mangawhai Artists Gallery over the winter months for a wide-ranging series of art classes and workshops. Beginning on Saturday, June 9, there will be eight weeks of different workshops at the Moir Street gallery, teaching aspects of drawing, painting, mosaics and printmaking, all led by experienced tutors and practising artists. Winter Workshop programme coordinator Nicola Everett says they have something for all levels of experience and everyone is welcome, whether they are new to art or more experienced. Elena Nikolaeva will be running four workshops. There are 13 workshops in all, plus other demonstrations and activities, ranging in duration from a single session of less than two hours up to a course of six weekly sessions. Topics include Digital Drawing, Hands On Charcoal, Painting With Spatula & Squeegee, Perspective in Landscape Painting, Mosaic With Found Objects, plus a whole week exploring different printmaking methods from July 14 to 19. As well as the workshops themselves, Mangawhai Artists have also planned some drop-in events for Saturday mornings when the village market is running, including a free customised T-shirt bag-making session on June 30 and a Fish Print fundraiser on July 23, plus demonstrations of artists at work on June 9 and 21. The Winter Workshop Programme runs from Saturday, June 9 through to Sunday, August 5. There will be a display of work created throughout the programme held on the final weekend at the gallery between 10am and 3pm. Full details of the courses, tutors and how to book a place can be found at mangawhaiartists.co.nz/learning-opportunities. Art exhibitions in Mangawhai will be taking a pause for the approaching cold season, however this does not mean the popular Moir Street art gallery will be going into winter hibernation. Instead Mangawhai Art Inc (MAI) will be keeping the doors open with a series of stimulating Winter Workshop Programmes aimed to inspire and alight creativity through the colder months. Following on from the last exhibition of the art season, ‘Women on Fire’ (May 25 –June 6), MAI’s gallery will become the centre for 13 creative workshops from June 9 to August 5 including drawing, painting, mosaics and six days of printmaking. As the gallery sits at the heart of the Mangawhai Village Saturday market, drop-in events are also planned, along with demonstrations from artists at work who will be available to talk to visitors about their artistic process. All tutors are experienced and practising artists, guaranteeing a supportive and encouraging environment for participants, and coordinator Nicola Everett says the workshops are suitable for people with all levels of experience, from novice to veteran artists. Artists at work demonstrations begin the programme on June 9 as well as July 21, with artists keen to talk to people about their processes for making art and being creative. Carol Marianne of Plastic Free Mangawhai is offering a free workshop on June 30 for people to not only learn how to make t-shirt shopping bags but also have the chance to customise it with a personalised print. Demonstrations on last years highly successful and popular fundraiser ‘Fish Print’ will be repeated on July 23. Well known for her stimulating workshops and skill and positivity as a tutor, Elena Nikolaeva is offering a one day workshop – Perspective in Landscaping – the first of four workshops she will be leading. ‘Introduction to the Art of Mosaics’ is a three day workshop by Pat George who has over 30 years experience as a ceramic artist. 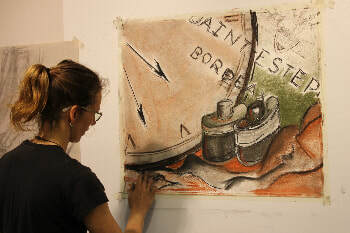 Print week from July 14-19, provides opportunities for participants to explore various printmaking techniques including collagraph, lino cut, monotype and drypoint. Run by Wendy Clifford, Nicola Everett and Lynn Middleton, a variety of printing presses will be available with the final two days for self-managed printing with tutor support. “We hope people will come and try out different techniques and on the last couple of days take the opportunity to print an edition of a print, perhaps 5-10 copies or develop one of their own printing plates in a variety of ways,” says Lynn. Other highlights of the Winter Workshop programme include charcoal and pastel drawing with Wendy Clifford, dramatic drawing with Wendy Leach, exploring colour with Lynn Middleton, a one day silver clay workshop led by Jenny Crundwell, and Gayle Forster is leading an opportunity for those interested in understanding the process of creating a series of artworks. 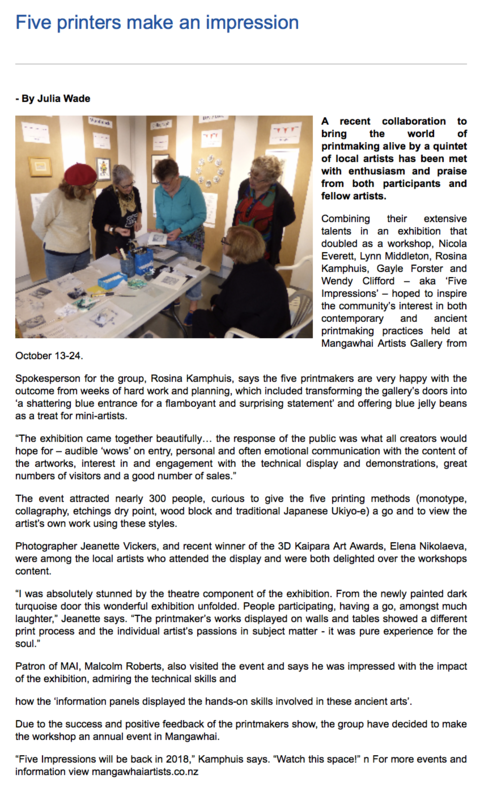 For more information on the Winter Workshop Programme, visit mangawhaiartists.co.nz/learning-opportunities. Budding artists of all ages and artistic levels have been finding their way down to the local art gallery over the last two weeks, immersing themselves among quirky-shaped canvases and fluorescent paint. Mangawhai Artists Inc. (MAI) second community art project, ‘Magical Mangawhai Goes Bush - One Moonlit Night’, has been deemed a huge success attracting close to a thousand locals and visitors through the gallery doors, MAI spokesperson Lynn Middleton says. Middleton says the free creative event would not have been possible without the support of local sponsors. ‘One Moonlit Night’ was opened by Kaipara Mayor Jason Smith on May 5 and will be showcased until May 13 and people are welcome to collect their painted items after the exhibit closes. demonstrations, and occasions to develop personal art knowledge and skills in a supportive environment. There are half-day, whole-day, weekend and weekday options beginning Saturday, June 9. “We hope that people will come and try out different techniques,” said media spokesperson, Lynn Middleton. 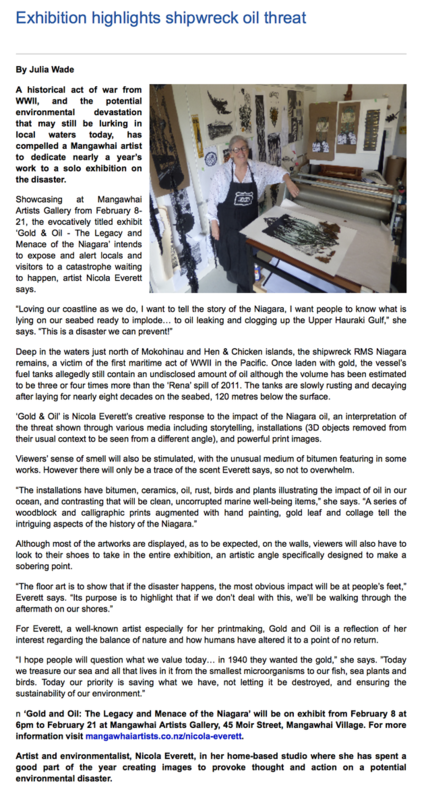 Nicola Everett, of Mangawhai Artists Inc, is coordinating the programme. “We have something for all levels of experience; workshops are suitable for beginners, you only need an urge to learn and play. Our tutors are experienced artists and teachers and welcome people new to art or returning to art. On June 30 there is a free workshop showing people how to make their own T-shirt shopping bags and customise it with a print. Print week July 14–19 will provide opportunities to explore various printmaking techniques, with participants able to choose from several workshops. On July 23 a repeat of last year’s popular fundraiser, “choose your fish, choose your paper, and print” will be held. The Kaipara’s artistic community is a vibrant one, with a wealth of styles representing influences from the whole grand sweep of human culture. From sculpture and abstract paintings to stunning realism and avant-garde photography, in media as varied as wood, steel, canvas, paint, stone and natural fibres — our local artists never fail to impress or inspire. With such a wide range of styles and such a diverse pool of talent, one of the most difficult jobs of the year must surely be judging the premiere artistic event of the year, the Kaipara Art Awards. Growing year by year and with a formidable roll-call of artists entering the competition, this annual exhibition of our brightest cultural creators has become the definitive place to bring one’s vision to the public eye. Last year saw a massive response from the artistic community to the call for submissions, and they are steadily coming in for 2018’s gala gallery opening on July 6. The winning entries for 2018 — Rebecca Clist’s A Walk in the Evening Garden in two-dimensions, and Elena Nikolaeva’s Toni the Tui from Tawharanui — will be an inspiration for this year’s entrants to reach for new heights of acuity and imagination. With only a few weeks left before submissions close, the organisers of the Kaipara Art Awards wish to encourage up-and-coming artists to rise to the challenge. can change and evolve during the creative process. Simply make the decision to share your vision with the wider community, and then craft your masterpiece! 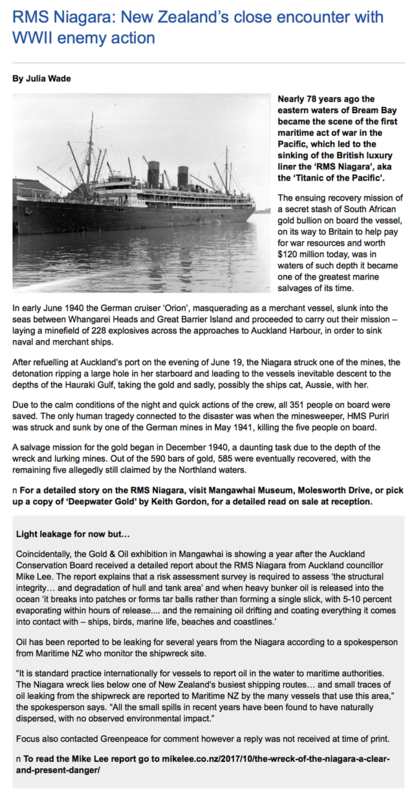 Many of you who are regular readers of Dive will be aware of the watery grave of the 159m luxury liner RMS Niagara which was a casualty of mines laid by the German Raider Orion in the Hauraki Gulf during WWII. Her sinking just north of the Mokohinau Islands in the early hours of the 18th June 1940 was the beginning of various successful attempts to salvage most of the over eight tons of gold bullion on board. For the voyage to Vancouver, Canada, it is conservatively estimated that between 9–15 tons of fuel oil was on board. The blast from the mine released tons of oil that smothered many kilometres of New Zealand’s North Island coastline, mainly from Whangarei harbour southwards. It is believed that the amount of oil on the coast was larger than what was deposited on the beaches in the Bay of Plenty when the MV Rena grounded on Astrolabe Reef, south of the city of Tauranga on 5th October 2011. Interestingly, you can still find remains of Niagara’s oil along the coast today! 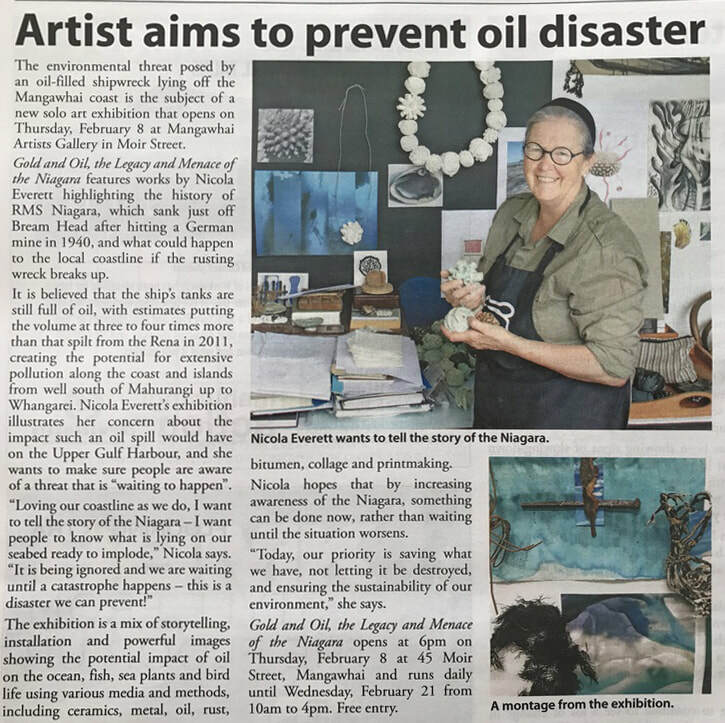 On the 10th February 2018 at the Mangawhai Artists Gallery, artist Nicola Everett opened to the public her year-long work titled ‘Gold & Oil – The Legacy and Menace of the Niagara’. Her obvious passion and commitment to bring to life what occurred 78 years ago off the coast of Mangawhai and the possible environmental ticking time bomb within the wreck can only be loudly applauded. Her work is stunningly creative and her message to her local community and the New Zealand Government was very clear! We need to act now, not wait until we have to clean up the suffocating oil deposited along our coast. Her collection of woodblock and collagraphic prints tell the story of the mines being laid, Niagara strikingthe mine and sinking, as well as the recovery of the gold and the death of marine and bird life as the result of the oil that was released at the sinking. The artwork that made a strong statement to those who attended was a visual representation of what you could expect from a new release of oil from the wreck. Hanging from the ceiling over a patch of oil-impregnated sand were the real remains of birds and fish covered in black oil! Nicola is creative enough to know she needed something that really confronts people in an artistic form of what may happen. Over a period of a year she had collected dead sea birds and fish skeletons from the shoreline. She then slowly dried these remains in an oven and then coated them in black bitumen which represented the Niagara’s thick smothering bunker oil. This very visual artwork clearly shows Nicola’s commitment to awakening people’s awareness of the results of an oil spill. Councillor Mike Lee expresses his concerns re the possible environmental risk that the wreck represents. Guests included Kaipara’s deputy mayor, Peter Wethey and author Keith Gordon, whose book, Deep Water Gold, details the history of the Niagara’s sinking, the gold recovery and the subsequent first dives by remote operated vehicles (ROVs), followed by the first modern day technical mixed gas divers exploring the wreck in 120 metres of water. Two contrasting speeches were delivered; Mike Lee the Waitemata and Gulf Ward Councillor, and Belinda Vernon from Maritime New Zealand. Mike Lee is absolutely passionate about the Gulf’s marine environment and has actively been notifying Government departments, as Keith Gordon has also over many years, re the necessity to survey the fuel tanks’ condition and the amount of fuel oil remaining in the wreck. This means being able to evaluate the possible environmental hazard that the ship’s oil represents. The response to their warnings have largely been ignored by Government departments. I got the impression they are fully aware of the situation but just want it to go away. Why? My guess is money! There is a realisation that what needs to be done in the first instance is a non-intrusive investigation of the ship’s fuel tanks to calculate how much oil remains. This can most likely be done with a combination of ROVs and divers. Once this is done, the Government will know 100% how big the environmental threat is. What we do know 100% is the wreck is steadily decaying and it is not a matter of WILL the oil be released but WHEN. Let’s hope the Government heeds the warnings and advice from experts and opens its cheque book to have the required investigations done. As we go to press I understand that Conservation Minister the Honourable Eugenie Sage is considering a meeting with Mike Lee & Keith Gordon. The oil’s time bomb is ticking 24/7. Nicola Everett’s art work is for sale. Contact her: nicolaeverettartist@outlook.com. The Mangawhai Museum has an excellent display of items recovered from the Niagara, courtesy of Keith Gordon. On display is the ship’s bell, telegraph, speed log and even a replica of the diving bell used to recover the gold. You can step inside and watch a video. A recovered mine is also on display. The quality of the museum’s display is world class and I strongly recommend a visit. ​Mangawhai’s many artists will be opening their doors and displaying their talents throughout the Easter weekend during the annual Mangawhai Art Trail. The work of 48 artists will be on display at 18 separate venues, from cafes and churches to artists’ own studios and the Mangawhai Artists Gallery in Moir Street. Paintings, prints, drawings, pottery and sculpture in a diverse range of media and styles will be exhibited and available for sale. A map and guide to participating artists and venues is available online, or an illustrated booklet and map can be bought for a gold coin from shops and businesses in Mangawhai Village and Mangawhai Heads, and at the Saturday morning market in Moir Street. 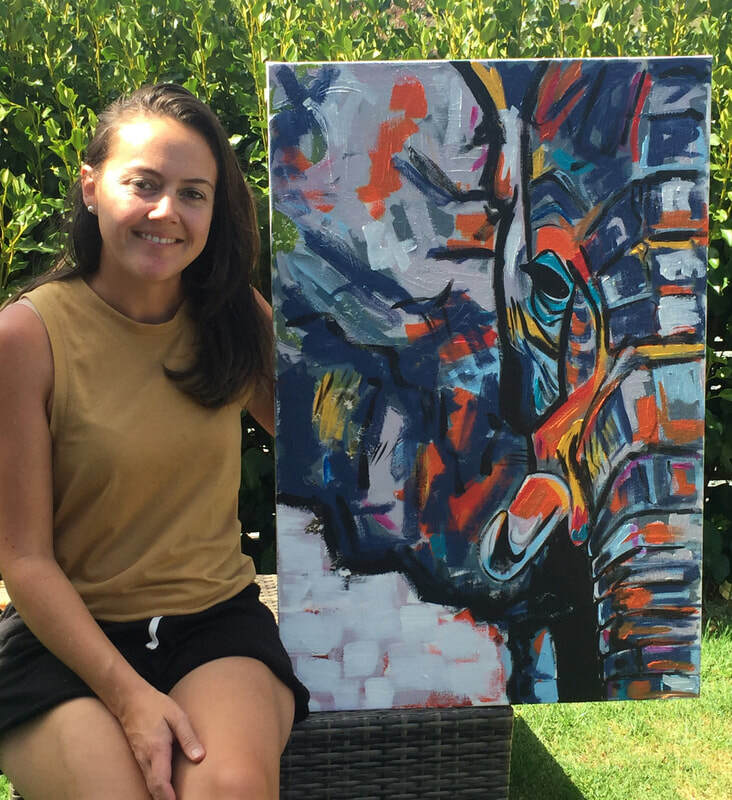 Mangawhai artist Lynn Middleton says the chance to go behind the scenes and see how and where artists produce their work is always popular. 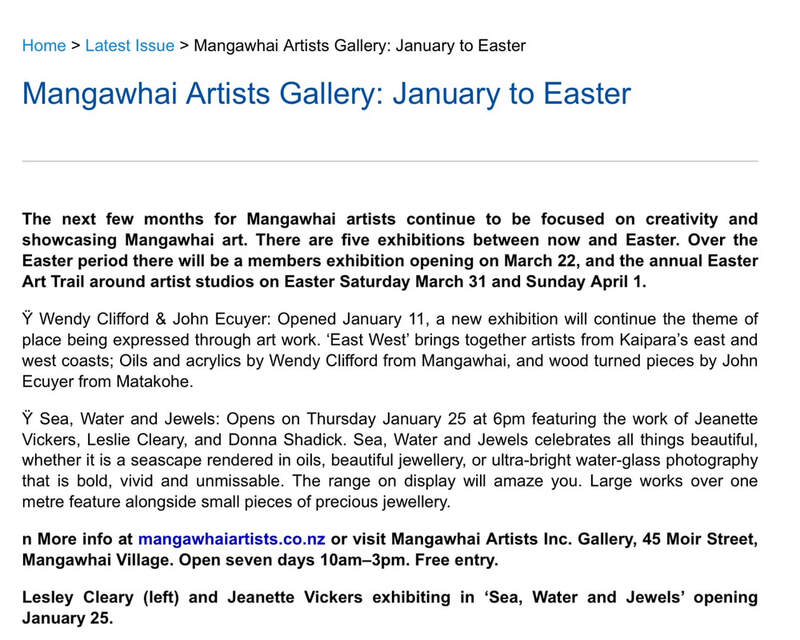 The Mangawhai Art Trail will be open from 10am to 4pm on Saturday, March 31 and Easter Sunday, April 1. The artist behind the successful Stingray Project in Mangawhai last year has organised another community art initiative to celebrate native bush and the flora and fauna that comes with it. Magical Mangawhai Goes Bush is a free community art project led by Rosina Kamphuis and opened on Friday, April 19. “We hope that lots of people from every age group will come along and paint, then come back and explore the exhibition’, Rosina says. “This art project is for the Mangawhai community, families, artists, businesses, everybody.” The Mangawhai Artists Gallery has been transformed into a community art painting centre for the duration of the workshops, and all ages can come along. No art experience or painting skill is required. ‘One moonlit night ...’ will use all of the painted material from the workshop to make an exhibition and installation evoking native bush at night. Mayor Jason Smith will open the exhibition on Saturday, May 5 at 3pm. Following the success of last years community art project, Mangawhai residents and visitors are once again invited to come together and merge their imaginations for another united artwork. Due to the popularity of Project Stingray in April 2017, which celebrated Mangawhai’s iconic stingray and is now mounted on the exterior wall of Mangawhai Artists Gallery, creator and coordinator, multi-talented local artist Rosina Kamphuis, has organised another thought-provoking art event, this time based on the areas natural environment. Deputy mayor Peter Wethey opened the Mangawhai Artists Gallery doors to the public on April 20, inviting people to ‘drop in and paint’ on a variety of nature-made media including stones, real bush materials and trees as well as cloth banners. Art work will then be collated into a spectacular installation bathed in the night sky inside the Mangawhai Artists Gallery by Rosina and her artist team, to be unveiled by mayor Jason Smith on May 5. Rosina says the event is an opportunity for people in the community of all ages to paint, talk and have fun together. Magical Mangawhai Goes Bush! One Moonlit Night… is on now, everyday from 10am-3pm at Mangawhai Artists Gallery, 45 Moir Road, The Village, April 20 - May 3. For more information view mangawhaiartists.co.nz. Mangawhai came alive with colour and creativity over Easter weekend, with visitors and locals alike treated to a stunning and diverse visual array of the areas vast talent and artistic genius. The Mangawhai Artists Inc (MAI) annual Easter Art Trail gave viewers an opportunity to view the works of over 50 local artists, from multi-media paintings illustrating the areas natural beauty and dramatic coastline, to landscapes created from pure imagination and provocative graffiti art as well as delicate glass creations and dynamic wood and steel sculptures. Nineteen venues were included in the trail including the Pioneer Village Heritage Church, Mangawhai Artists Gallery as well as private studios and galleries. MAI chair, Mary-Anne Boyd, says visitors were overwhelmingly enthusiastic for the art on show and variety of venues. A number of sales were recorded especially in the last half hour of the Trail with one artist even receiving a phone call on the Sunday night from an enthusiastic buyer, asking to buy an art piece and commission more paintings. Although numbers were down from previous years due to Mangawhai having a range of activities on over the long weekend, hot sunny beach weather as well as the 12-hour road closure of State Highway 1 on the Saturday, some venues experienced higher than average visitors, Boyd says. 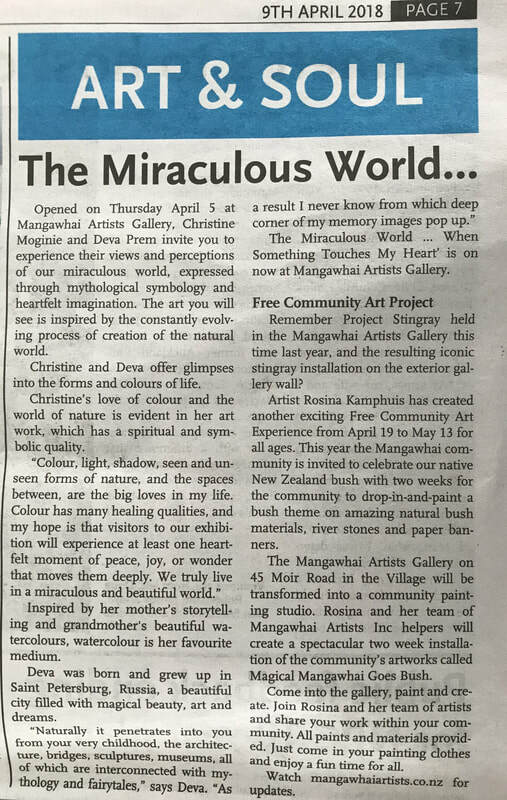 Following the success of last year’s Project Stingray art project, the Mangawhai Artists Association is again inviting community involvement for its newest art experience entitled Magical Mangawhai Goes Bush. The artists are asking the community to celebrate the native New Zealand bush by visiting the gallery between Thursday, April 19 and Tuesday, May 1 to paint a bush theme on natural bush materials, river stones and paper banners. All paints and materials are supplied, and all ages are invited. The Mangawhai team will then spend four days completing an installation of the pieces within the gallery creating a scene under a night sky, and the exhibition will be officially opened on Saturday, May 5 and close on Sunday, May 13. Last year over 300 people helped paint the 101 plywood stingrays, 58 of which are now installed on top of the two giant rays on the exterior of the gallery. “They represent all of the 101 painted, all ages, kids and families, artists, businesses, everybody!” says creator of the concept, Rosina Kamphuis. The Mangawhai Art Trail on Saturday, March 31 and Sunday, April 1 offers art lovers the opportunity to enjoy a wide and varied range of work from Mangawhai’s vibrant artistic community. More than 50 artists will display their work at 19 locations ranging from paintings, ceramics, photography, sculpture, outdoor art and more. The event also offers a unique opportunity to meet with the artists. The event is run by Mangawhai Artists Inc to promote and support art in the community. Members range from full-time professionals to weekend hobbyists. The trail will run from 10am to 4pm each day and guide books will be available at retail outlets in Mangawhai village and at the Saturday morning markets. 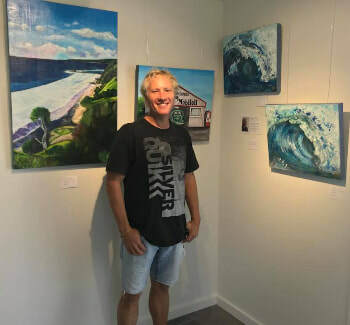 Mangawhai artist, Johnnie Daley, and his partner Becky, opened their Scarlet Art Gallery above Bennett’s Chocolate Factory last Friday, March 16. “This is a big step up for us,” says Johnnie, who plans to show the work of 15 to 20 artists. The couple, who named the gallery after their daughter, Scarlet, will run it between them. An area has been set aside as a studio and Johnnie will be working there five days a week. Well known as an exponent of the realism school, Johnnie has always wanted to be an artist. “I’ve been drawing since I could first hold a pencil and am both self and YouTube taught, which is a great way to learn and why I now share a lot of my techniques on social media to support other budding artists,” he explains. ”Up until three years ago I made my living in other ways, but then I realised it was time to spend my time doing something I loved and here we are." 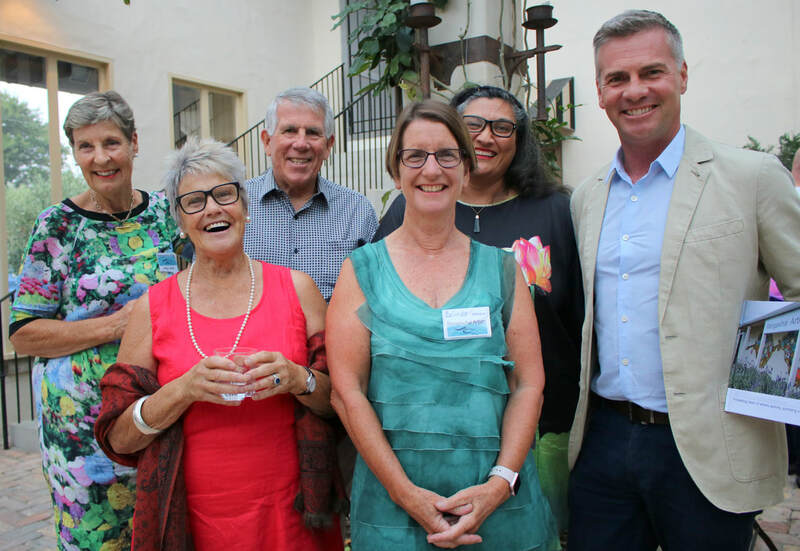 A collaboration between two significant Mangawhai associations has resulted in a recent successful fundraising event and proved to be yet another testament to the extraordinary and diverse artistic talent that resides in the area. 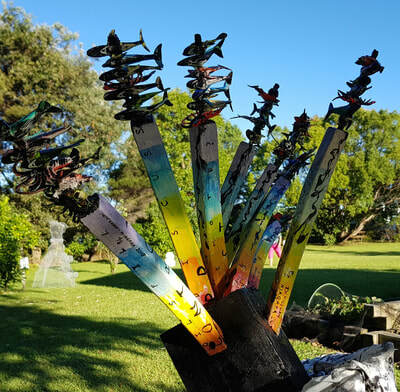 Social services organisation, Te Whai Community Trust (TWCT) and Mangawhai Art Inc (MAI) joined forces and coordinated the weekend outdoor exhibit, Sculpture in the Park, held on February 24-25, to showcase creations of 22 mainly local artists. TWCT member Isabel Hollis and husband Brian opened their home on Moir Street, Mangawhai Village, for the event, allowing visitors to wander around the lush gardens to view a range of sculptures created from a variety of media including driftwood, glass and mosaic as well as more surprising materials such as barbed wire, tinfoil and even beach trash. Local band Raw Jam, featuring Mangawhai wood artist Larry Park who also had work on display, enticed guests to relax in the grounds and enjoy a freshly prepared Devonshire tea. Northart’s twice-yearly members’ shows are always much anticipated and very special events, highlighting as they do the considerable achievements of the painters, photographers, print makers and craftspeople who make up the dedicated group of artists associated with the gallery. Currently running through three galleries, this year’s summer exhibition is particularly diverse and lively, with 58 artists providing works in oil, linen, drumsticks, wood, and decorative cords. 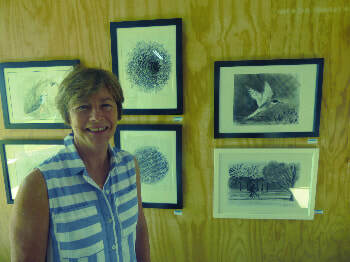 Mangawhai is represented by a vertical exhibit from Gayle Forster (pictured). Entitled ‘Crescendo’ it reflects both intensity of sound and upward movement symbolising the tides of life – the rise and fall and the rise again. The vertical format is based on the Japanese kakemono or kakejiku (hanging scroll) and can be hung then rolled when not in use. Decorative ribbons can also be used as part of the work or tucked in behind to enhance or elicit a change of mood.  Northart, Norman King Square (Opposite the Library), Ernie Mays Street, Northcote, Auckland. Online northart.co.nz. North Comes South – Mangawhai meets Whanganui is a collection of art that chases away doubts about the standard and quality of local small town art. 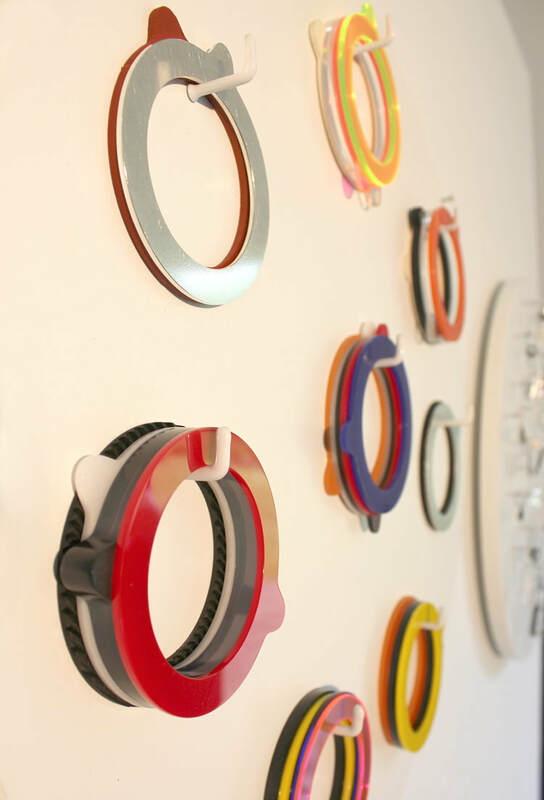 The 11 artists contributing to North Comes South show vibrant, diverse and eclectic art – stunning art work. Pauline Neilson offered space at the Yellow House Café, Whanganui and invited Jeanette Vickers of Mangawhai Artists Inc to gather artists who would share their work with Whanganui. Vickers loved the space and knew Mangawhai Artists could show well in the space available. Curating a selection of art from the talented pool of Mangawhai artists was a significant challenge for her but, undaunted, she narrowed her selection to 11 out of 130 artist members of Mangawhai Artists Inc. All 11 artists have had successful exhibitions in the Mangawhai Artists Gallery over the last year. They are adept, technically skilled in their field, and, importantly, their work has flair, creativity and captures the viewer. Jeanette Vickers wanted a rich and diverse mix to show off Mangawhai art. She used colour and form as a selection guide to bind this exhibition into a strong showing of work. The exhibition in the Yellow House Cafe is a fascinating taster into Mangawhai Artists Inc, an art association run by artists for artists. 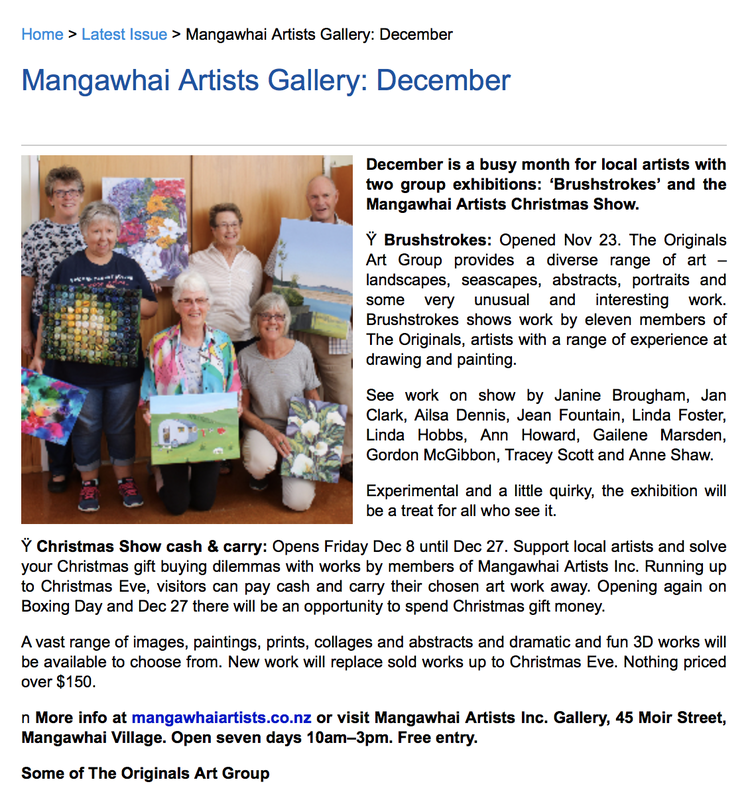 Mangawhai Artists has a thriving membership active in presenting their work to the community. Around 50 artists are exhibiting their work in this season's busy calendar of exhibitions which change every two weeks from September to June each year. There are two members' exhibitions each year open to all members, an annual art trail when many artists open their studios and a stunning website which profiles members showcasing a busy exhibition calendar, events and learning programme. North Comes South: Yellow House Café cnr Pitt and Dublin Sts. 8am to 4pm daily until March 31. The latest art exhibit to hit Mangawhai has astonished and alerted audiences with its confronting creativity and underlining crucial message. More than 60 locals and visitors attended the official launch of artist Nicola Everett’s confronting exhibit ‘Gold and Oil – The Legacy and Menace of the Niagara’ on February 10. Viewer’s expressed their surprise and shock of not only learning for the first time about the sinking of the luxury ocean liner but also the current environmental threat from the vast amount of oil still present in the rusting hull. A victim of the first WWII maritime act of war in the Pacific, RMS Niagara lies 120 metres below the surface on the seabed just north of the Mokohinau and Hen & Chicken Islands, after colliding with a German mine in June 1940. The volume of oil held in the decaying tanks is estimated to be three or four times more than the MV Rena spill of 2011, New Zealand's worst maritime environmental disaster. Included on the guest list was concerned Waitemata and Gulf Ward Councillor Mike Lee (an advocate for government action regarding the oil leakage), Maritime NZ (MNZ) representative Belinda Vernon, Conservation Minister the Honorable Eugenie Sage, Kaipara deputy mayor Peter Wethey, and author Keith Gordon who wrote ‘Deep Water Gold’, a book telling the complete story of the Niagara. Mike Lee says he was impressed although not surprised – given the close location of the wreck to Mangawhai’s shores – at the turnout and the depth of concern from locals regarding the oil threat. She also said the Crown will be ultimately financially responsible for the costs of investigating and extracting the oil or the cleanup, if the oil suddenly spills from the wreck. Keith Gordon commented that Everett’s artwork accurately portrays the story of the doomed vessel. “The cost to remove the oil does not compare to the cost of an environmental clean-up,” he says. Frequenters of contemporary art galleries in Auckland will be familiar with Tatjana Panyoczki’s work. She’s been a full-time jeweller for two decades, with work in five galleries nationally and in Melbourne, too. 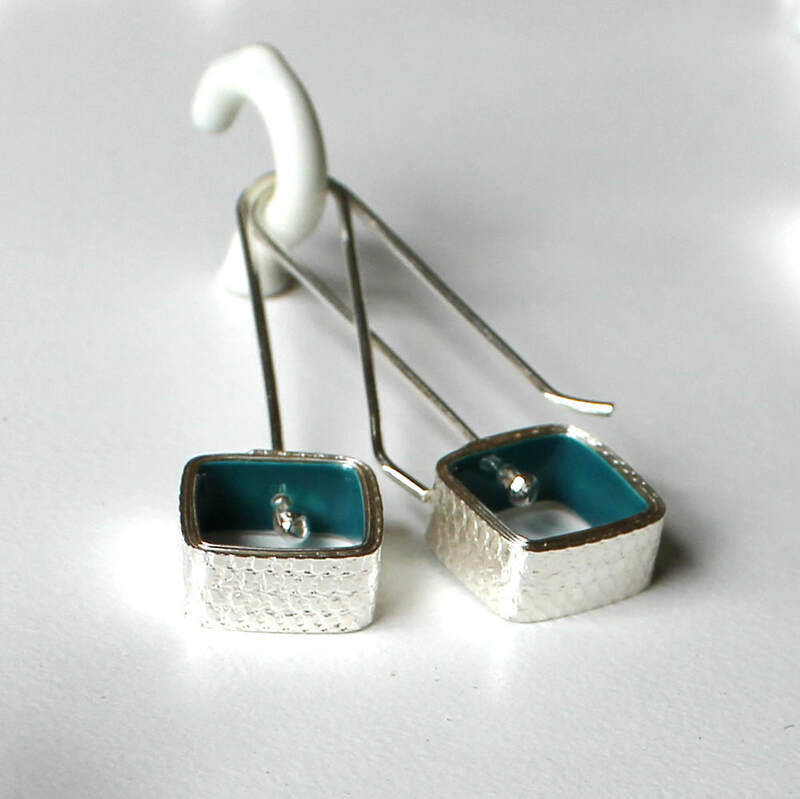 Her deeply crafted pieces blur the lines between jewellery and sculpture. “I think of them really as objects that can be worn on the body,” she says. We meet in the home she shares with artist Peter Panyoczki and their son Janos in Kaiwaka. It’s a modest, barn-like building externally, but the interior possesses the kind of effortless European style one would expect from a Swiss/Hungarian couple who have spent their lives dedicated to the arts. Tatjana is dressed in jeans and a plain grey t-shirt, with no makeup and her curly hair tied back: she is wholesome, practical, contained. 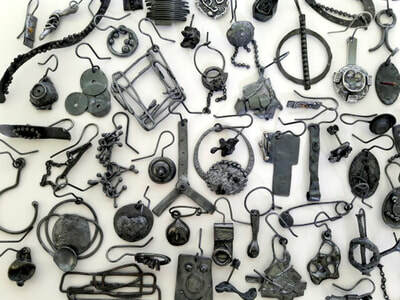 She makes tea and shows me what she’s putting together – a retrospective display of her work in media ranging from silver to Perspex, wood, wax and wool. “These represent my last 20 years – or maybe my first?” she says quizzically. 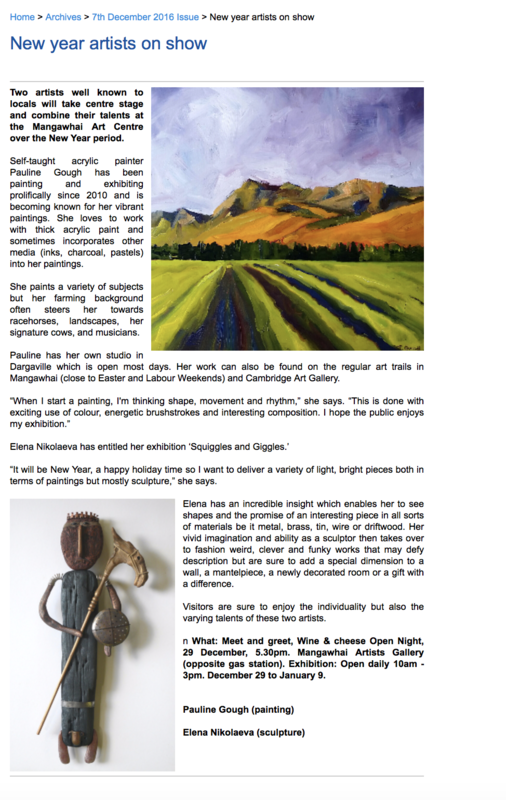 She and Peter are finally exhibiting their work together at their local gallery. “Mangawhai Artists Incorporated have asked us a few times, but there was always something going on,” she ruefully admits. Now, from February 22, the Moir Street gallery in Mangawhai will be filled with the couples’ internationally-renowned art. Some of the first work Tatjana did when she left her four-year Unitec course in 1998 has been her most enduring and continues to enjoys a brisk turnover. It’s her ‘Wrapped’ series: each ‘bead’ is crafted from multiple layers of metals rolled to 0.3mm thick. The top layer is usually textured and must be the right length to wrap the shape so the ends meet exactly. “My maths is quite good now,” she says, wryly. Finally, the inner rims are painted using a technique perfected by long experience. Other boards show bracelets from 2006 of silver and brightly-coloured Perspex, domestically inspired by preserving seals; silver box necklaces from 2007; colourful woollen pompoms dipped in wax from 2009. And rings of all metals, shapes and sizes. Tatjana receives regular commissions to make wedding rings, including those for what she believes was the first gay marriage in the country. 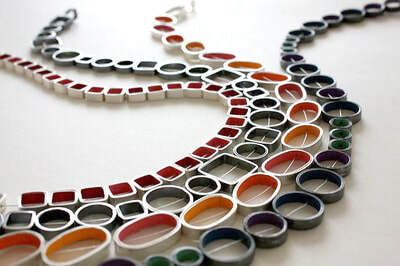 Her ‘In the Picture’ series features thin cross-sections of elaborate picture frames crafted into extravagant neckpieces. One was a finalist in the 2017 Contemporary Wearables Biennial Jewellery Award at the Toowoomba Regional Art Gallery and has now been acquired for the gallery’s permanent collection. But some of Tatjana’s most recent work is inspired by tragedy – a house fire at her parents’ home in Northland. Luckily, no-one was harmed, but sifting through the ashes she became fascinated by the effect of the extreme heat on various metals. ‘Vestige’ was the title of the first exhibition of this work at Avid in Wellington in November last year: melted, blackened, twisted and flattened, it’s different to anything she’s done before. “This process is organic, random – almost biomorphic,” she says. “So not me!” But a range of single earrings (“it’s hopeless trying to make a pair,”) fashioned from these found materials have flown out the door. 2018 holds potential new directions for the Panyoczkis. Peter has been awarded a 3-month James Wallace residency in Vladivostok, Russia, and Tatjana is going with him (Janos, too, for a month). It’s a vibrant city of 600,000 on the Pacific coast, 100km from the North Korean border. “Who knows what will come of it?” she says. “I’m just going to keep my mind open and soak it all up.” We’re sure there’ll be plenty of inspiration to kick-start the next 20 years of creative excellence. 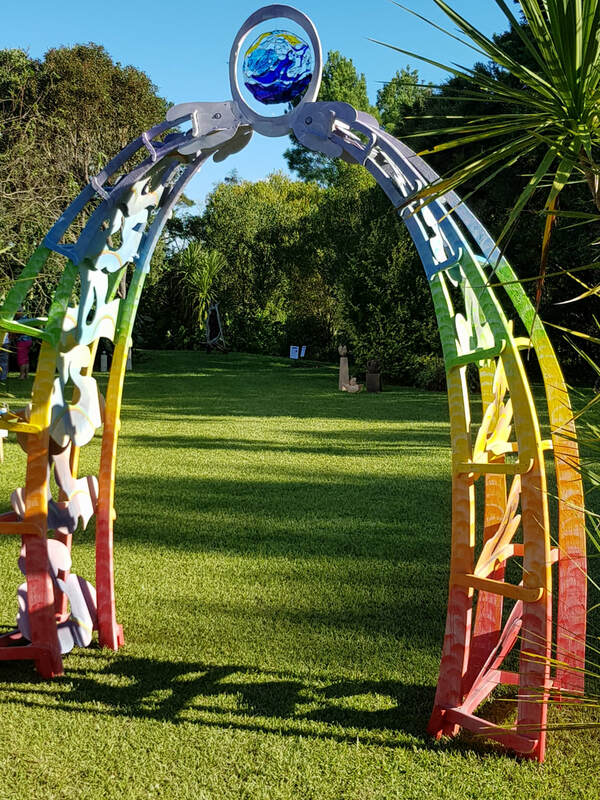 A diverse range of sculptures by more than 20 different artists will be on public display in a Mangawhai garden over the weekend of Saturday and Sunday, February 24 and 25. Sculpture in the Garden will take place at 69 Moir Street, the home and garden of Isabel and Brian Hollis. Mangawhai Artists member Lynn Middleton says this is the first time a sculpture weekend has been held, and many of the works on display will be for sale. “The beauty of the garden will delight gardeners and non-gardeners. It is a beautiful setting,” she says. There will be a special display of sculptures by the late Joy Agar, the first chair of Mangawhai Artists and a passionate advocate for local arts, who passed away in January, 2013. Money raised over the weekend will be shared between Te Whai Community Trust’s new office at the old Tara Road schoolhouse in the Pioneer Village, and Mangawhai Artists, who are expanding their gallery to include a new studio and a toilet. As well as works of art, Sculpture in the Garden will feature music and Devonshire teas. The gates will be open from 9am to 5pm each day, and entry costs $5 per person, or $10 for a family. 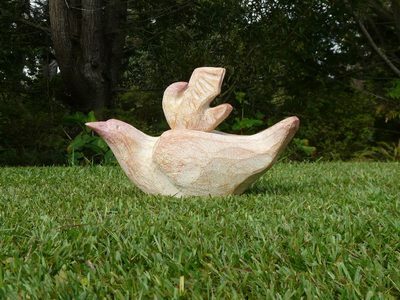 The Mangawhai Sculpture Garden Weekend will be held on February 24-25 and is the first of what organisers hope to be an annual event. This event will be held at Isabel and Brian Hollis' gardens in Mangawhai, and Mangawhai Artists Inc (MAI) and Te Whai Community Trust are working together to fundraise for development plans. The works of more than 20 local artists will be on display. 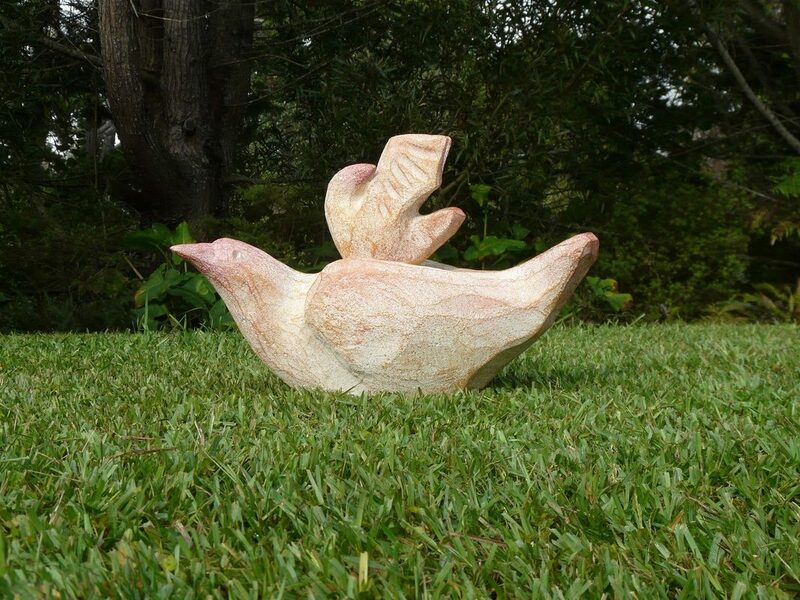 There will also be a special part of the sculpture garden displaying sculptures by Joy Agar, who passed away in 2013. Joy was the first chair of Mangawhai Artists Inc and was involved in the first art trail. She also made and designed the Mangawhai Museum stingray. Organiser Pauline Mann says the community groups wanted to honour her memory. 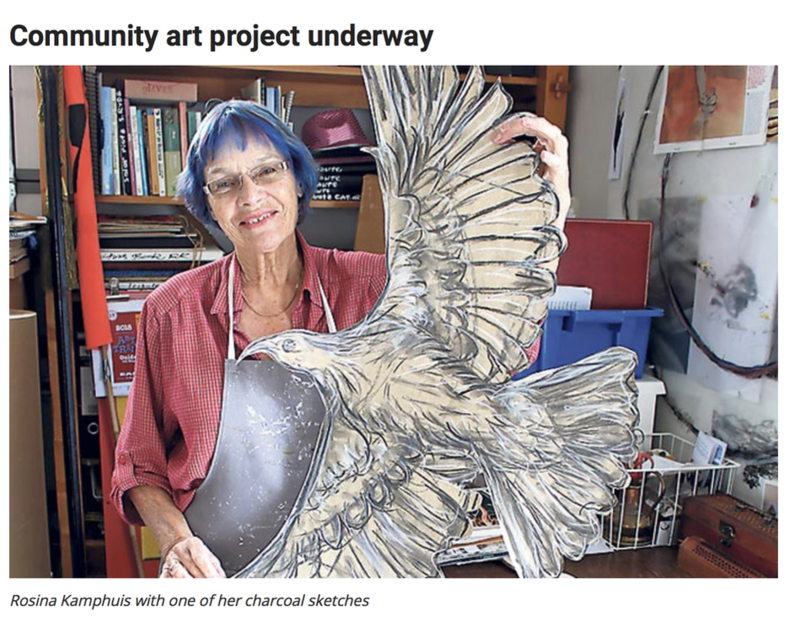 “Joy encouraged artists and wanted the Mangawhai art scene to grow,” says Pauline. The money raised will be equally shared between Te Whai Community Trust Mangawhai, helping to establishing their new office in the old Tara Road school beside the museum, and Mangawhai Artists Inc, who are expanding their gallery in the village to include a year-round studio for workshops and learning activities, plus much-needed facilities. To support the fundraising, all the artists are making a contribution to have their sculptures exhibited and will pay commission on sales. Sculpture Garden Weekend will be held over February 24–25 from 9am to 5pm at 69 Moir Street. Tickets are available at the gate on the day for $5 per person and $10 per family. 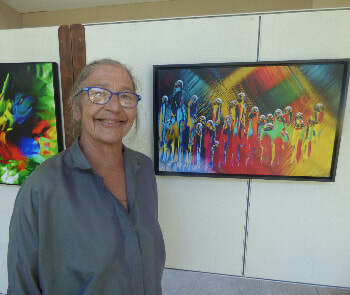 Taking a step into the unknown is often a daunting experience for most people, however for one local artist such a journey has liberated her artistic expression and led to her first exhibition in ten years. 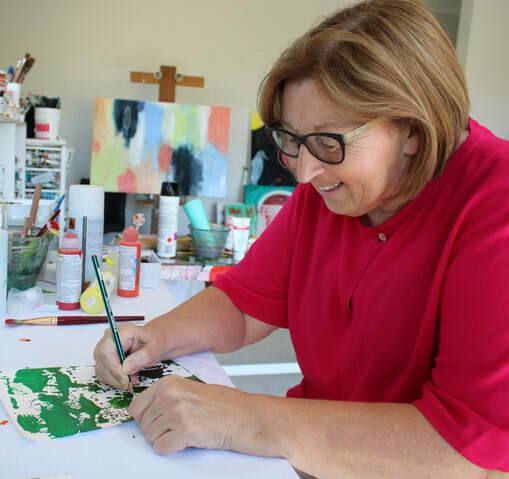 Multi-talented Mangawhai Heads artist, Wendy Leach, will showcase her new style - artworks that are vastly different from paintings she was renowned for over a decade ago – in a solo show appropriately titled ‘New Work’, at ArtHAUS Orakei, February 15 - March 4. A graduate of both Elam and Whitecliffe College art schools as well as a qualified high school teacher, Leach has worked as a professional artist since 1996. With twenty successful, sold-out exhibitions and travel adventures around New Zealand and overseas to inspire her art, she says her career was ‘humming along nicely… life was good’. However in 2005 Leach noticed an internal shift, a dissatisfaction with her work and she began to question herself as an artist. A dramatic change of direction was required. As a former art teacher Leach says she would always encourage students to challenge themselves in their work and to take risks without thinking too much about the results. However she admits that taking the leap herself was a difficult thing to do. Leach’s search for ‘more personal relevance and artistic integrity’ led her to become a student once again. Enrolling in a two year Masters of Fine Arts, she began to deconstruct and rebuild her ideas of who she was as well as herself as an artist. The process she says ‘led to a more meaningful and personally relevant way of working’ and resulted in the liberating creation of Leach’s graduation exhibition, ‘Light Paintings’ – photographs caught on slow shutter speed of moving coloured light – ‘which changed my art practise forever’. Her current work evolved directly from the light paintings and are ‘large, energetic and visually powerful’, illustrating her fascination with lines and how different types influence one another, ‘consider the fragility of thin lines, the strength of thick lines, curved lines express fluid movement, diagonal lines appear unbalanced, filled with restless energy, perhaps even falling over’. The prospect of a devastating oil spill from a sunken World War II wreck along some of our most beautiful coastline has been raised in an artist's exhibition which calls on the government to take action. And new documents show Minister of Conservation Eugenie Sage is raising conservation questions on an issue which saw little advice provided to her predecessors. The RMS Niagara - known as the "Titanic of the South Pacific" - lies in 120 metres of water off the Hen and Chicken Islands in the northernmost part of the Hauraki Gulf. It sank after striking a mine in 1940 with $500 million worth of gold on board and an unknown amount of oil. But it is believed at least 1000 tonnes remain in the hulk - more than three times the 300 tonnes MV Rena spilled across beaches and reefs around Tauranga in 2011. The exhibition is called "Gold and Oil: The Legacy and Menace of the Niagara" and opened on Thursday at the Mangawhai Artists Gallery. It runs until February 21. Artist Nicola Everett said the exhibition came out of a desire to express an opinion on the wreck and the danger it posed to the environment. "I wanted to make more people aware of this issue - this time bomb sitting out there." She said the story of the Niagara and the threat it posed was not well-known and was something she had only become aware of five years ago. "I have a sense there is a terrible potential there for devastation we could do something about." Everett said she wanted the wreck to be regularly monitored rather than relying on passing vessels to report any oil that had escaped. But she said ultimately, it had to be removed. "It's not 1940 - the oil won't be carried away into this wondrous ocean that seems to swallow all the rubbish we throw at it. "Better to do something about it than wait and say we will clean it up afterwards." The exhibition actively seeks to engage politicians on the issue with forms of support for people to fill in which would then be sent to Parliament. For all that, Everett said none of the many MPs invited to attend the opening turned up. The Auckland Conservation Board and Northland Conservation Board have urged the government to take action on the wreck. Auckland councillor Mike Lee has been a strong advocate for removing the oil, telling the Herald there was an increasing possibility of the ship's bulkheads collapsing. "The tanks holding this bunker oil are likely corrupt and a lot of oil will come up at once." He said there were estimates it contained as much as 1600 tonnes of oil and there was a need to get precise information on the condition of the wreck. An Investigation by the NZ Herald of documents spanning the 78 years since the Niagara sank recorded the extraordinary and secretive efforts to recover the gold. But similar efforts have not been undertaken to get the oil off the ship and some observers have reported slicks emerging from the wreck, stretching for kilometres. Maritime NZ's assessment of the Niagara found there was no immediate risk of a massive oil spill and there were sufficient containment and clean-up resources if it should disgorge its load. The type of oil and the depth it is at led experts to conclude it was unlikely to come to the surface, although a new plan was developed in 2016 to deal with a potential spill. New information released under the Official Information Act shows the Department of Conservation conceding that it has had "limited involvement in the management of the Niagara wreck". It had refused to engage in public comment on the issue, deferring to Maritime NZ as the agency responsible for wrecks. In a briefing to Sage, Conservation officials said they expected the government's stance to be criticised in the Herald investigation. As a result of the briefing to Sage, the department's position was shifting. Conservation Auckland operations director Andrew Baucke said the briefing had led to Sage directly dealing with associate transport minister Julie-Anne Genter on the issue. "While Department of Conservation staff have been monitoring the situation to assess potential risks to marine and bird life, to date it has not been a subject for a great deal of Ministerial advice." A well-attended art workshop has received rave reviews from the creative individuals who signed up for the recently held event. Celebrating Charcoal, an intensive ‘black, white and colour’ drawing weekend on August 26 -27, has been praised as ‘fabulous’, ‘totally inspiring’, well-organised and a whole lot of fun. 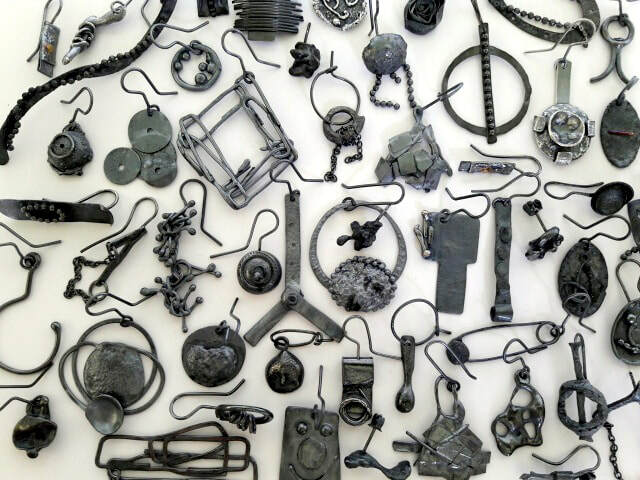 Created and tutored by Mangawhai artist Rosina Kamphuis, the workshop focused on theatrical still life props, organic matter and intriguing inanimate items, selected to unlock the potential and desire of the creator. 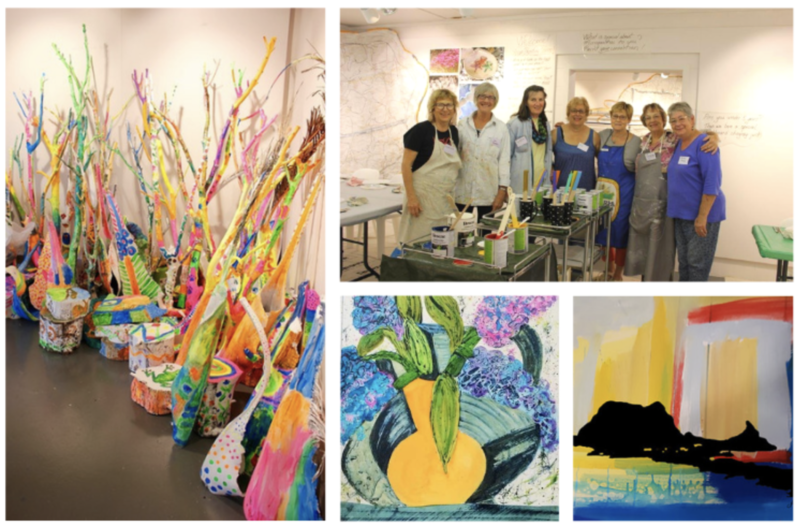 ​Local experienced artist and workshop participant, Wendy Leach says it was a ‘thoroughly stimulating weekend, with a great vibe’. Rosina says she was delighted with the enthusiasm and participation of the students. Below: Fingertips come in handy when creating original art. Five local print makers will be showcasing artistic printmaking with examples of their prints and demonstrations of printmaking techniques. Wendy Clifford, Nicki Everett, Gayle Forster, Rosina Kamphuis and Lynn Middleton are all members of Mangawhai Artists Inc and are experienced printmakers as well as working in other art mediums. 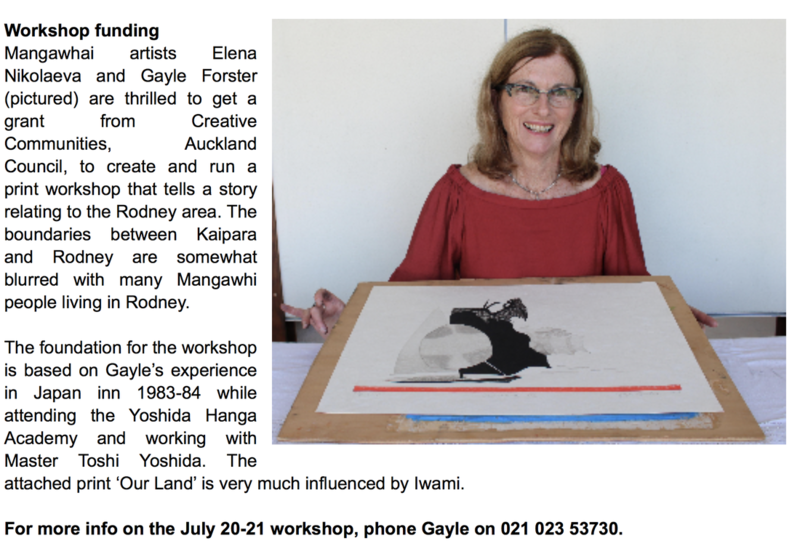 Calling themselves Five Impressions, the group all offer teaching opportunities and Wendy is well known for her winter drawing tutorials in the Mangawhai Artists Gallery. The current exhibition will show monotypes, collagraphs, etchings, dry point, wood block and traditional Japanese Ukiyo-e. Demonstrations are on Sunday October 15 and 22 on the hour from 10am, and on Wednesday October 18 from 1-3pm. ​Rosina (who lead the recent Mangawhai Stingray project) will be demonstrating etching and explaining how modern solar etching has developed from traditional acid etching. Gayle will be demonstrating a traditional form of Japanese woodblock prints, called Ukiyo-e which she explored during her time at Yoshida Hanga Academy, Tokyo. Wendy will be showing how her love of drawing can be extended into monotype printmaking, a simple process with endless possibilities for creative and imaginative expression. Nicki is exhibiting prints that explore the degradation of the marine environment and will demonstrate wood block and dry point. Lynn will demonstrate collagraph which is a form of printmaking that combines etching and relief printmaking.